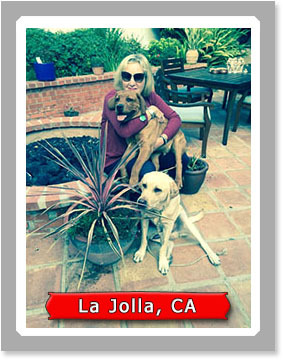 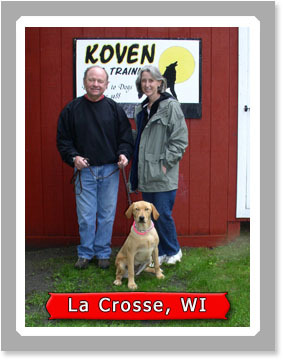 Our started trained family companion Labrador Retriever puppies will make an excellent addition to your home. 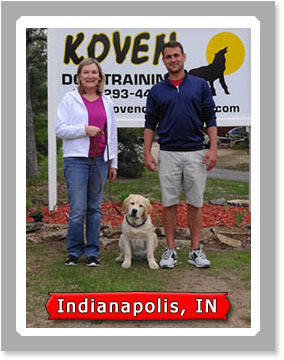 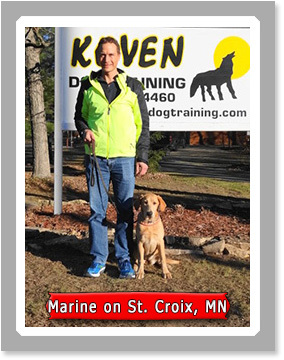 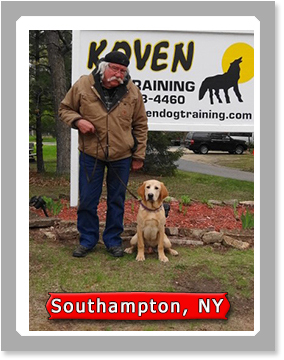 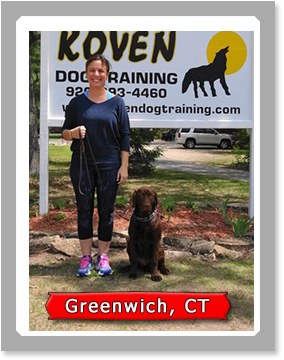 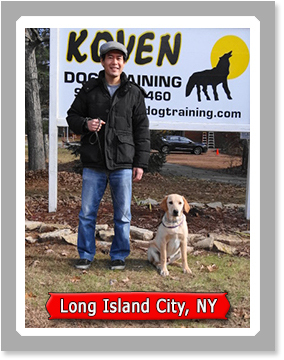 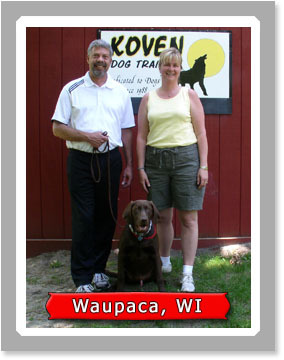 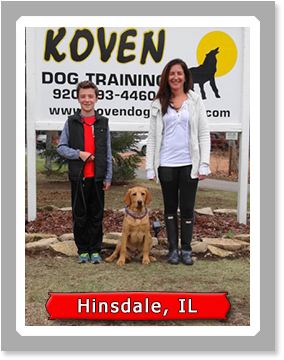 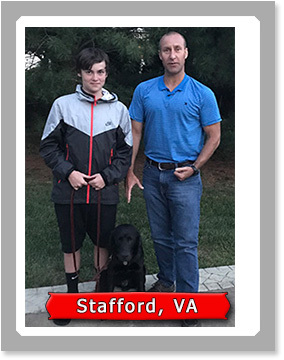 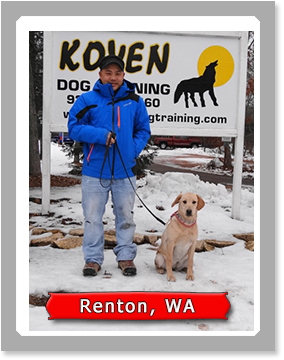 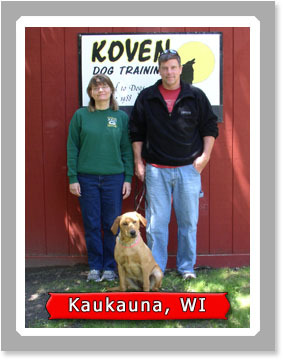 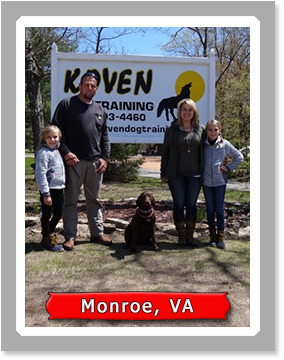 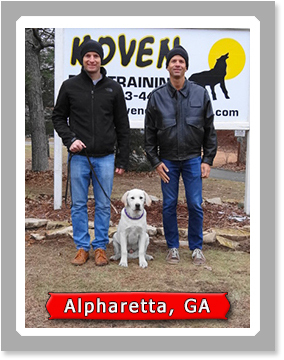 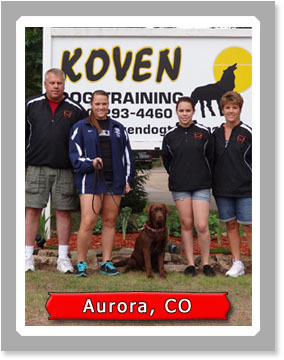 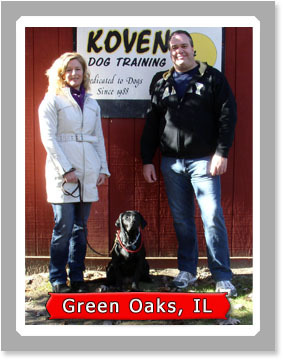 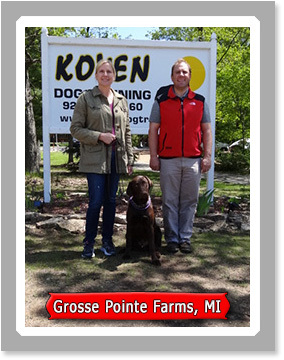 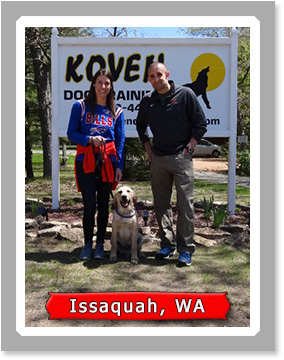 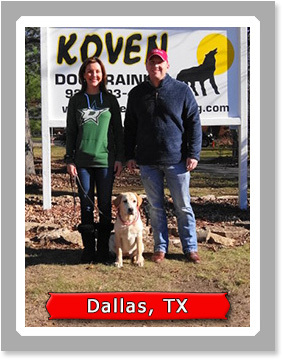 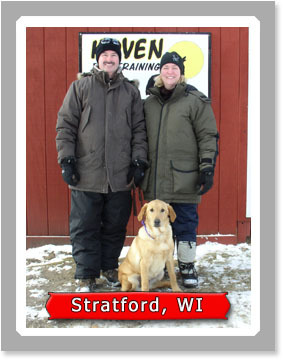 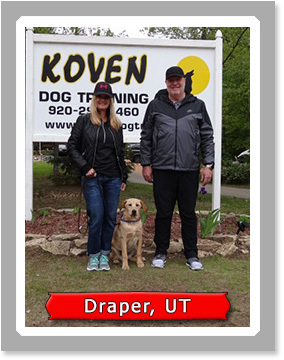 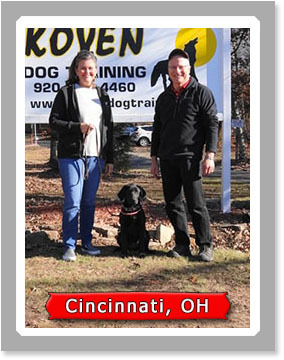 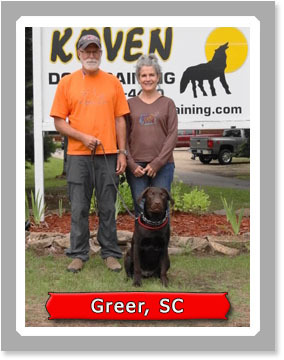 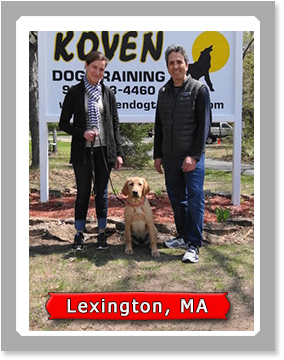 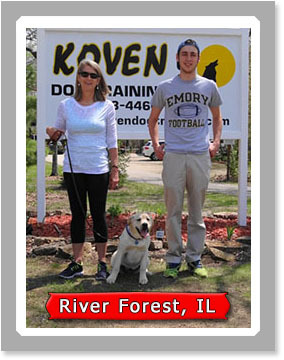 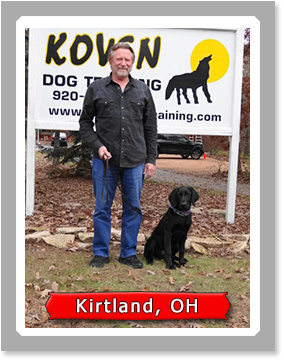 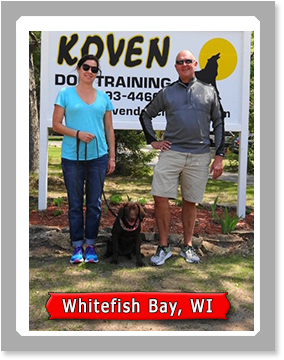 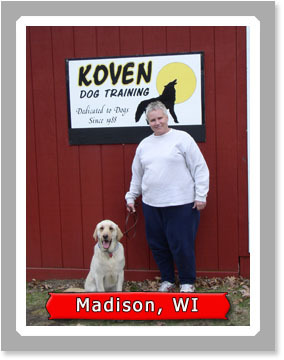 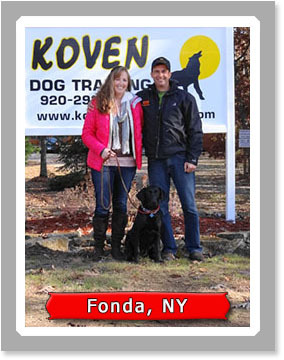 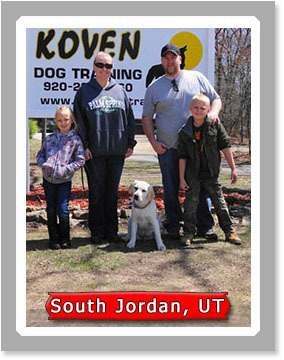 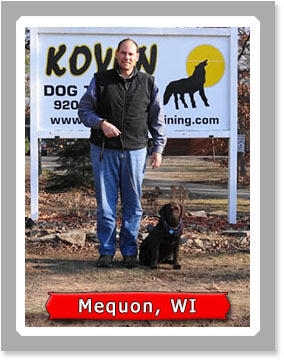 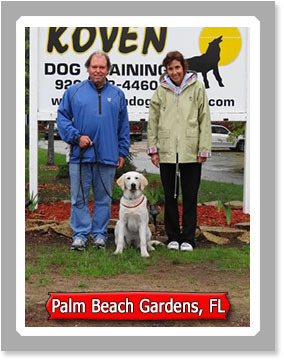 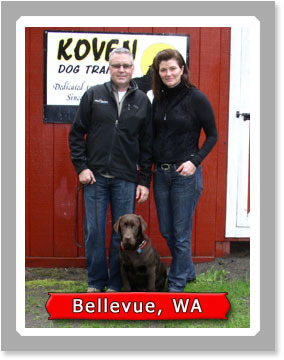 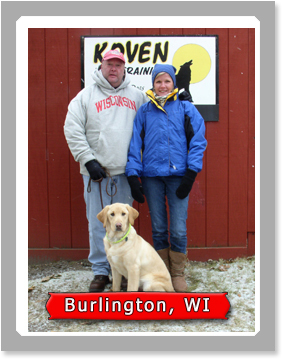 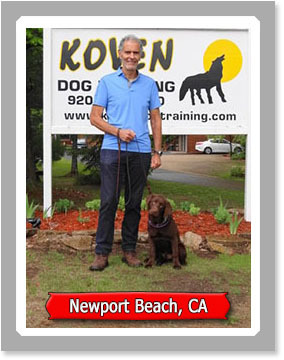 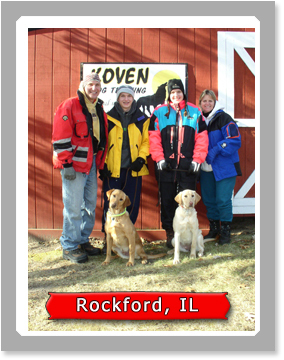 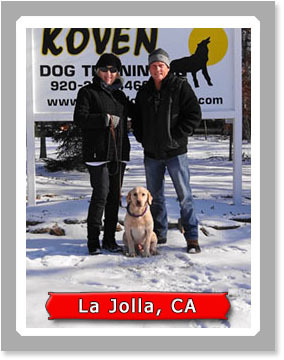 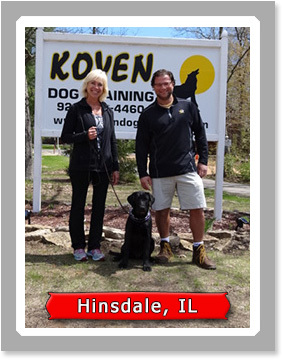 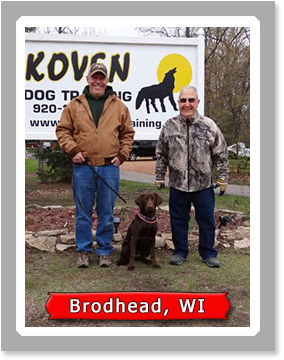 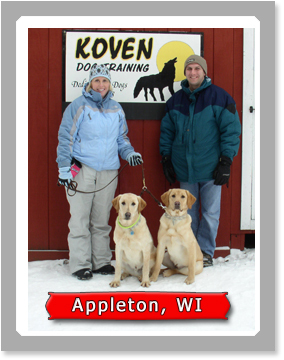 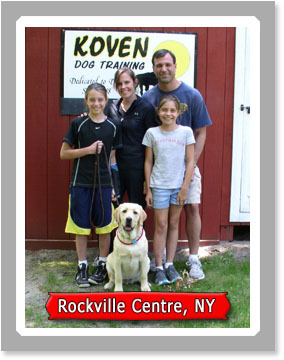 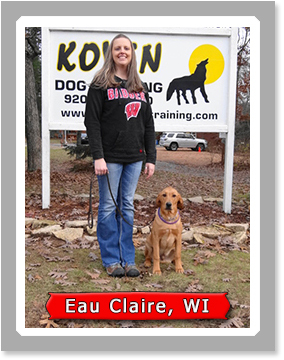 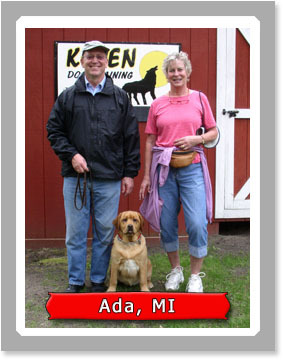 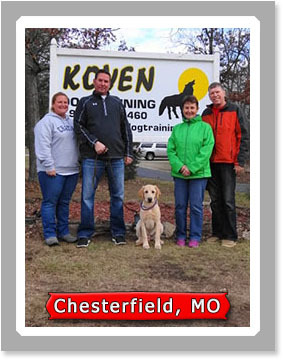 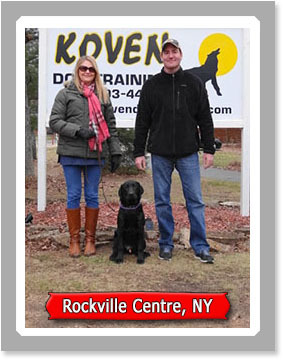 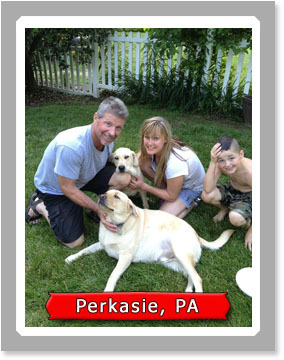 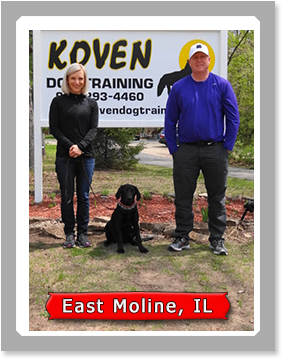 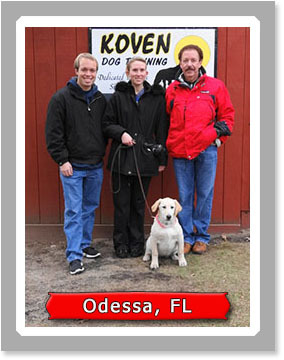 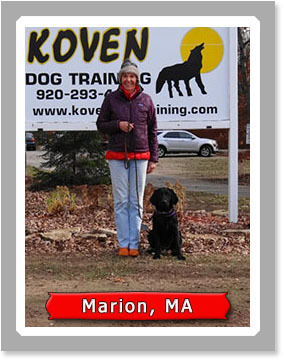 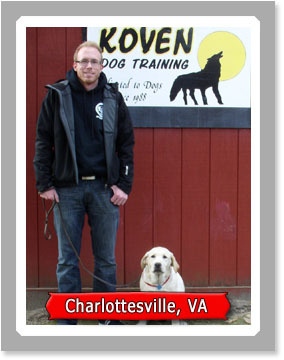 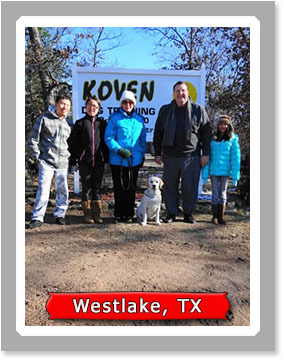 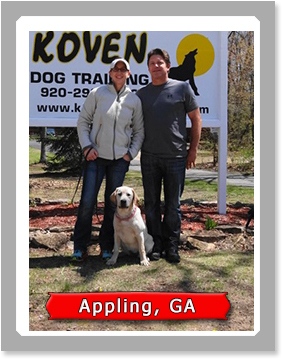 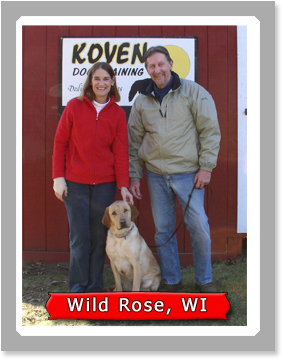 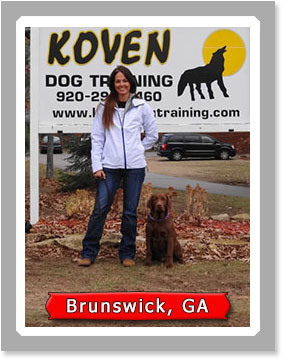 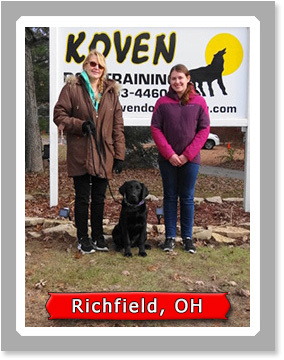 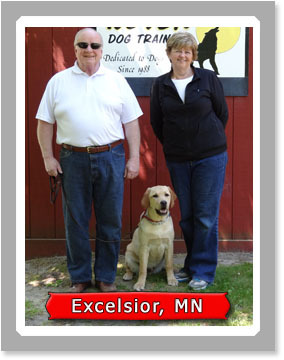 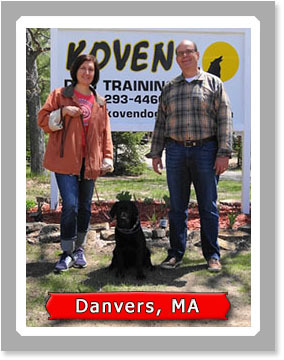 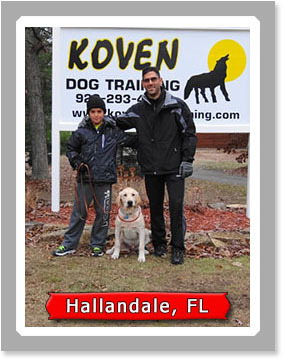 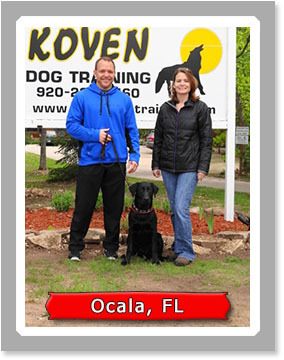 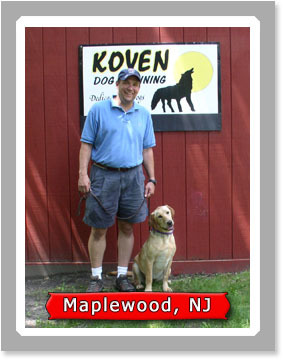 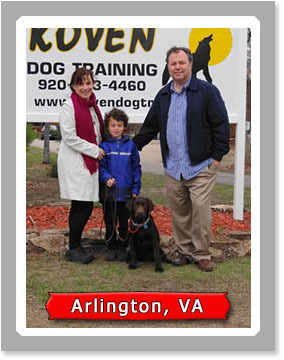 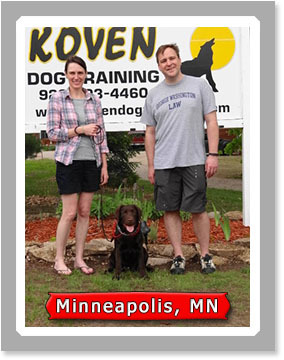 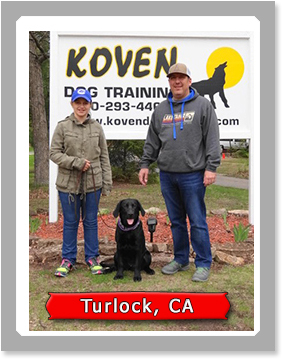 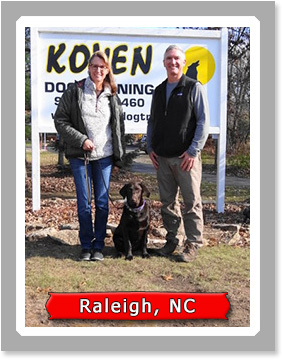 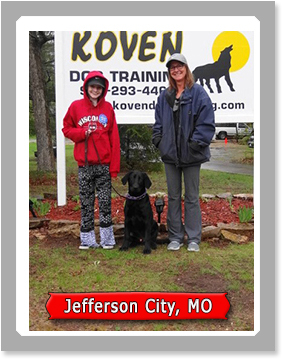 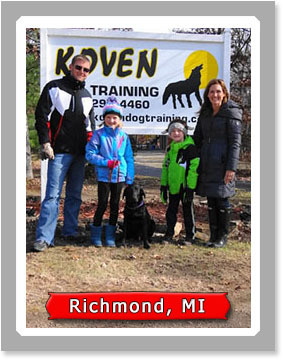 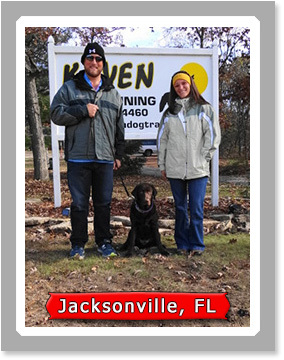 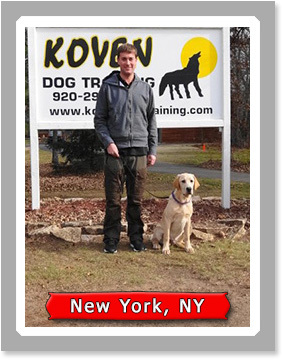 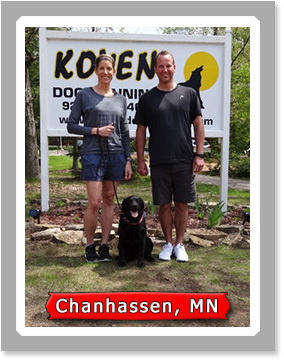 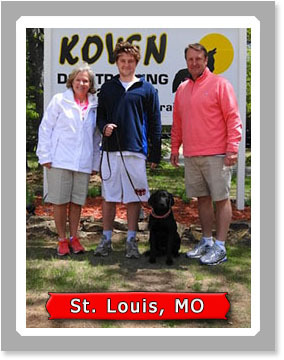 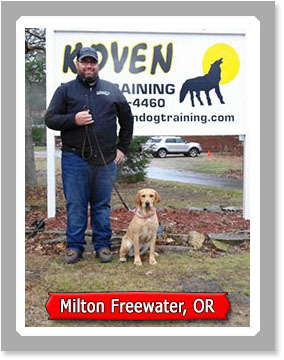 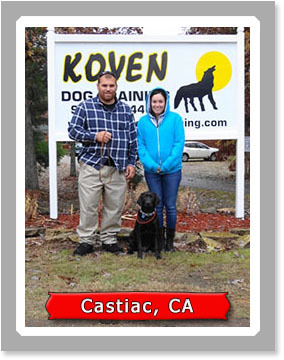 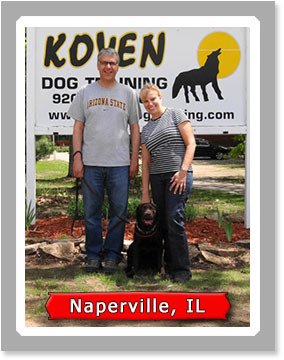 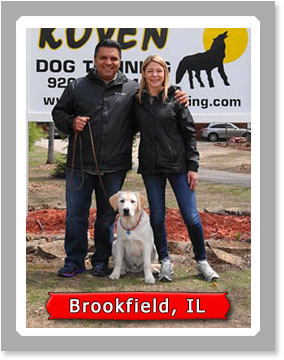 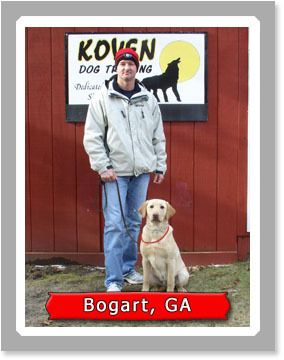 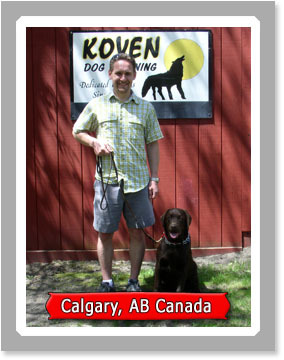 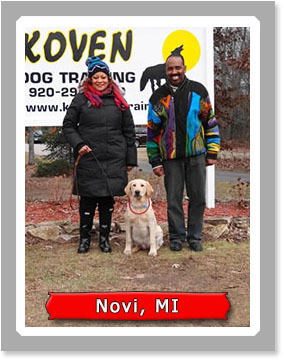 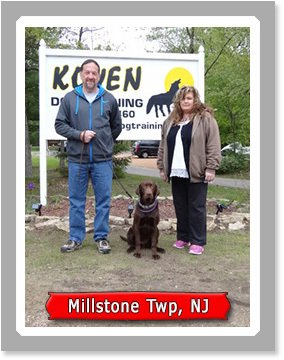 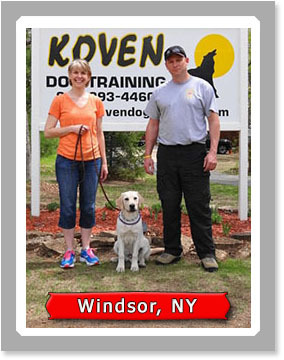 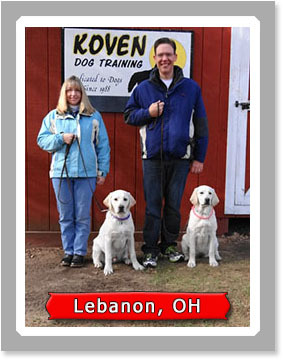 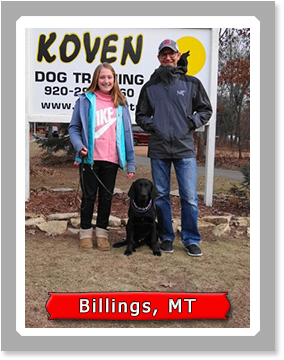 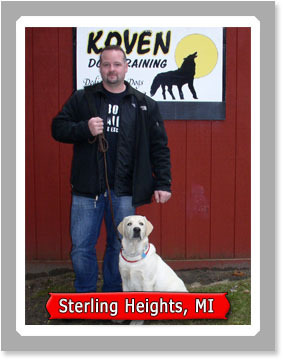 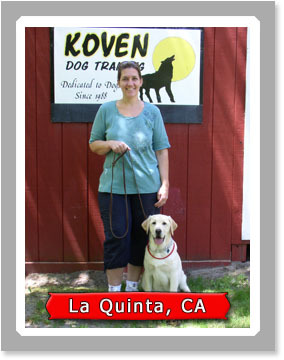 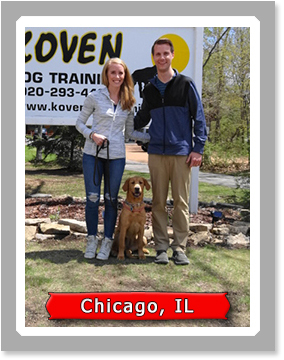 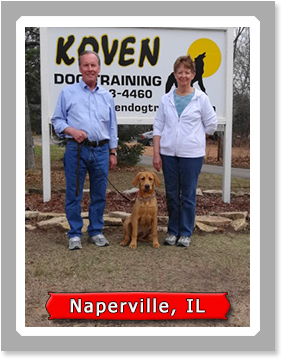 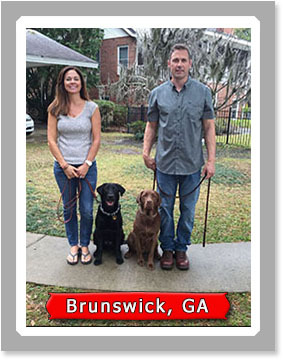 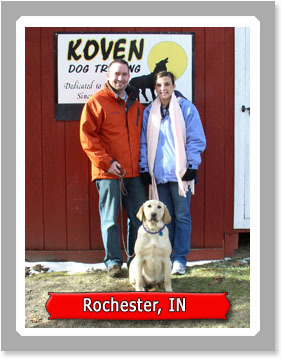 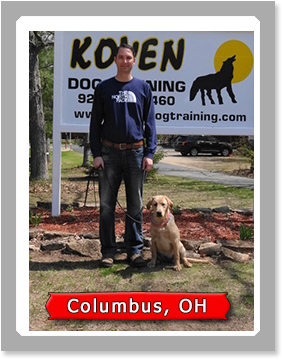 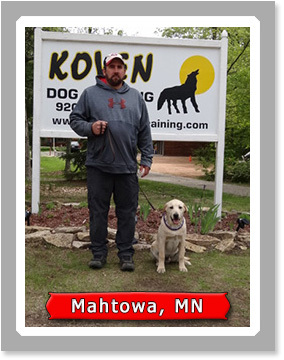 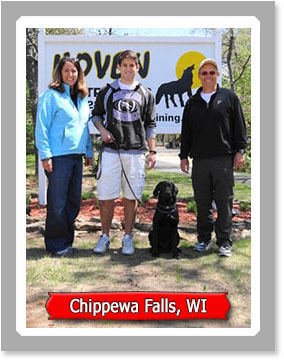 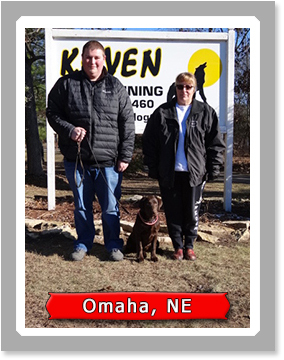 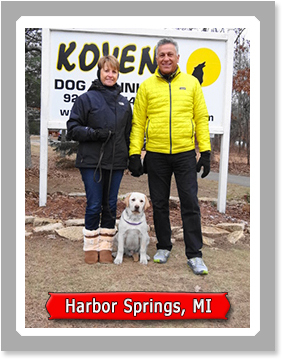 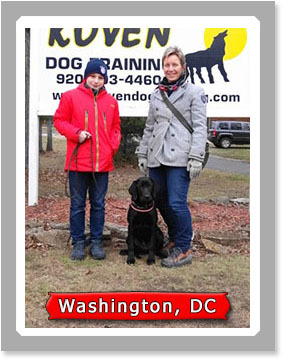 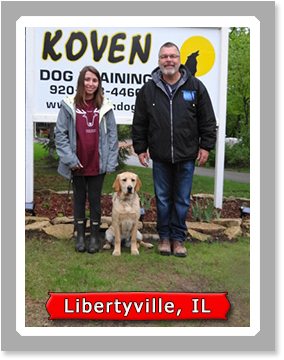 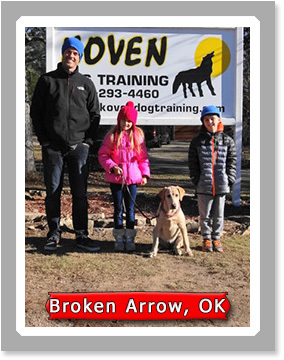 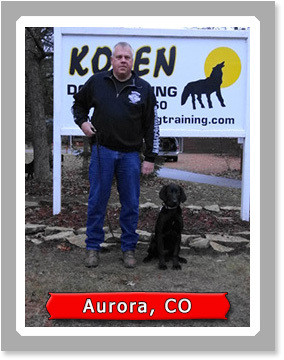 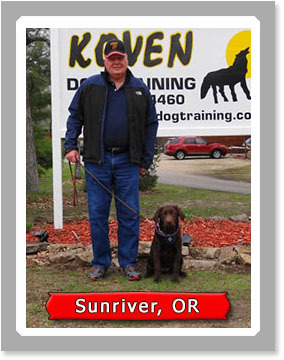 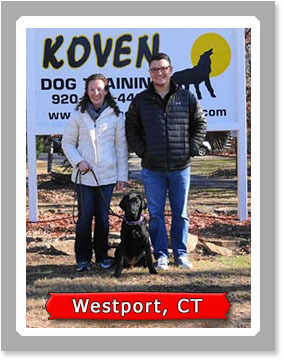 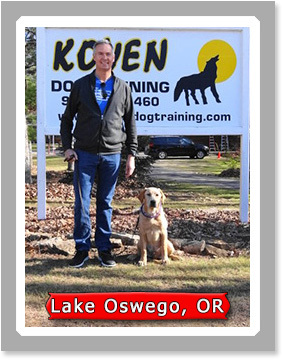 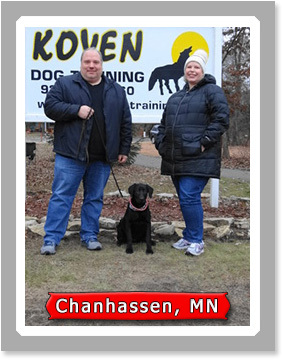 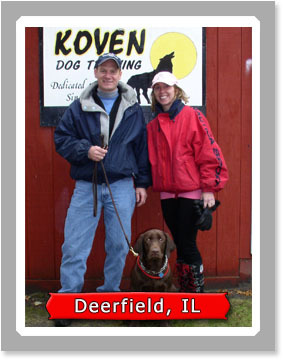 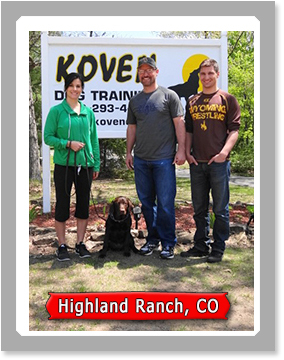 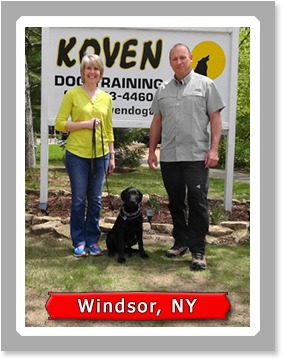 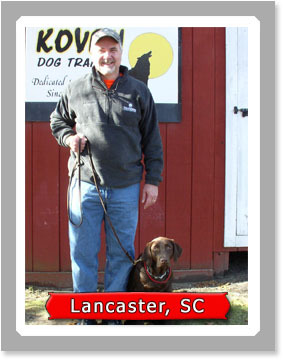 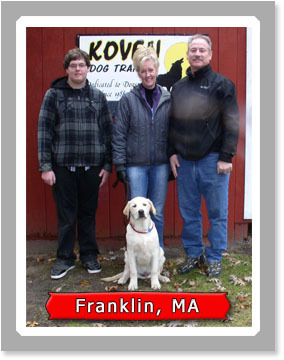 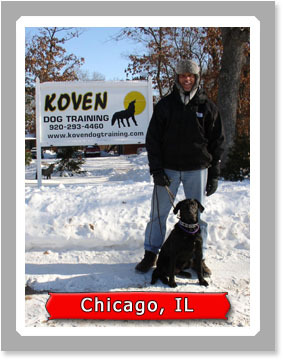 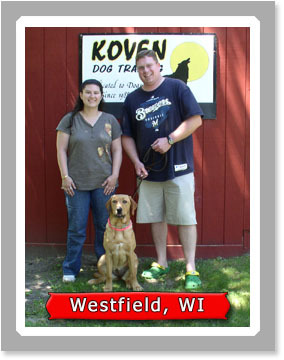 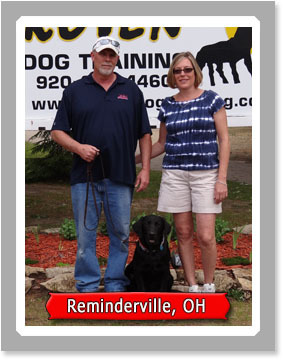 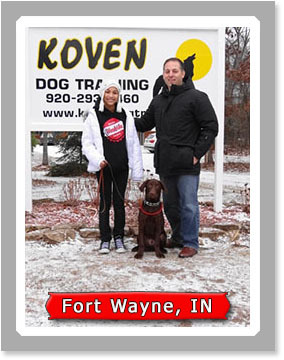 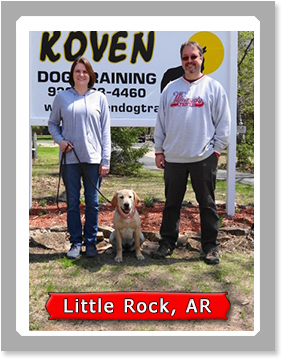 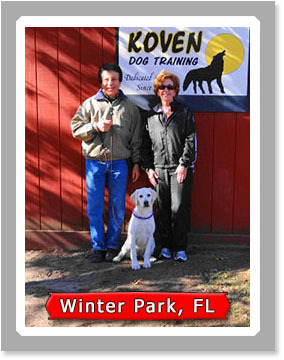 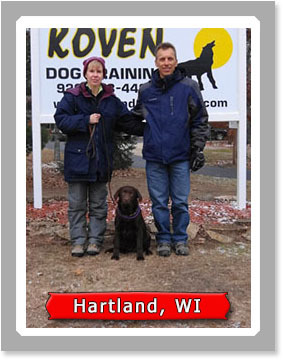 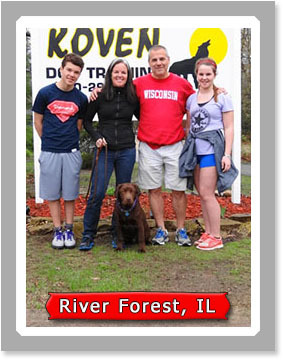 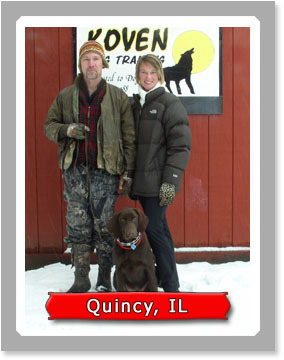 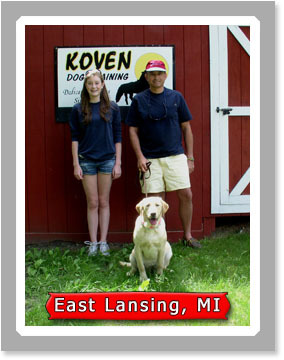 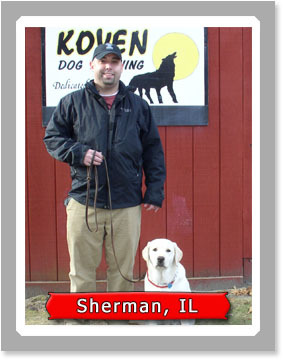 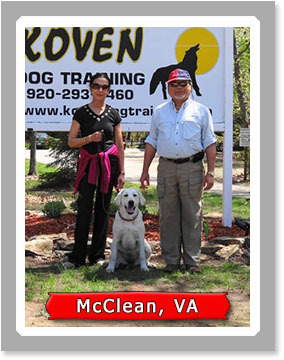 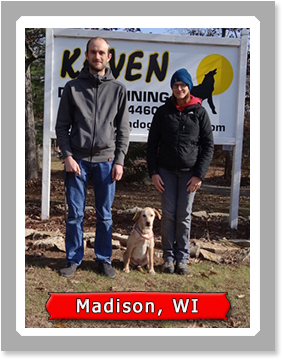 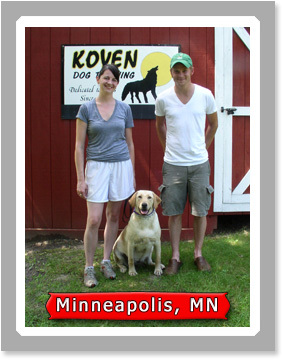 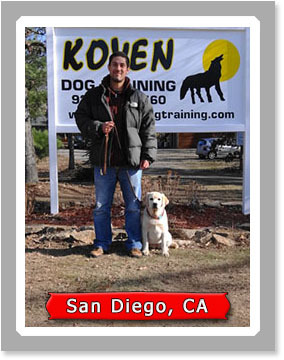 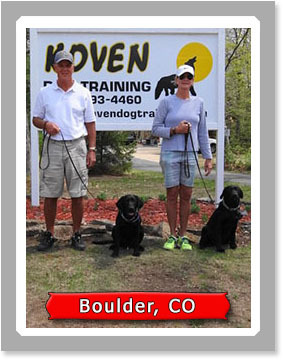 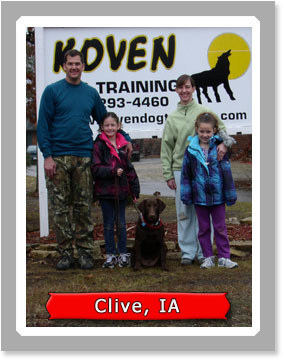 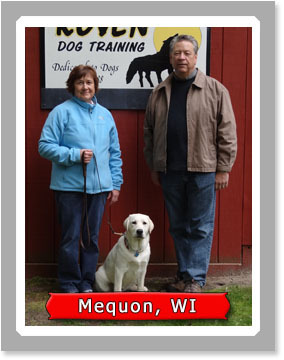 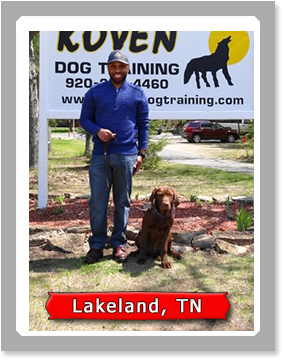 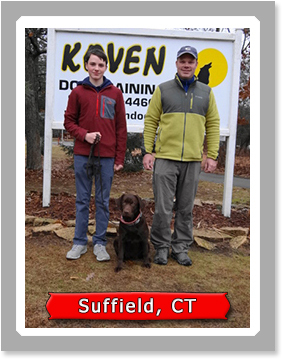 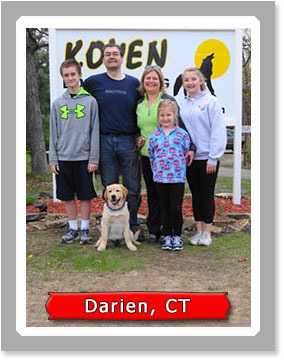 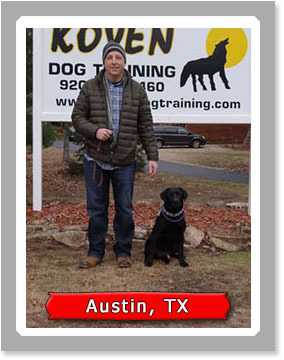 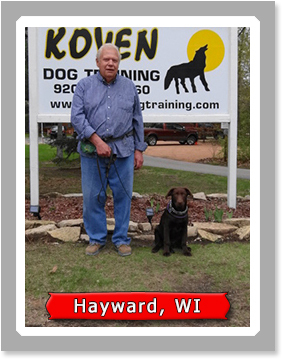 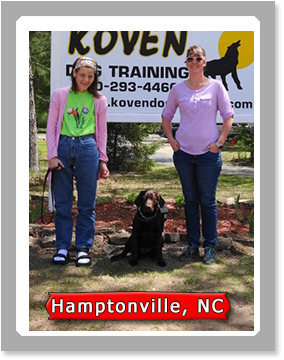 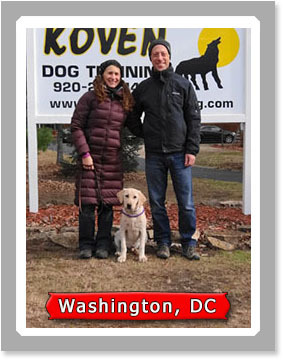 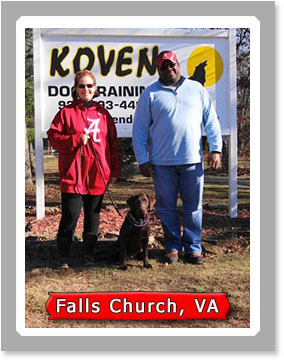 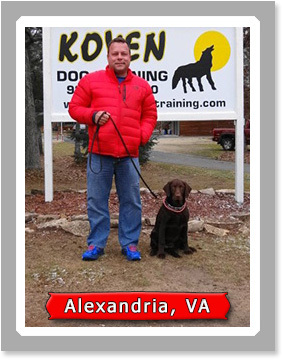 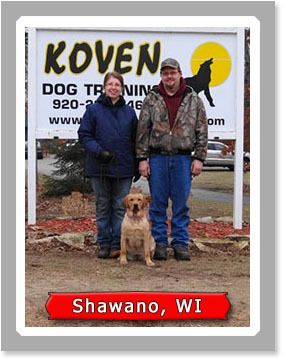 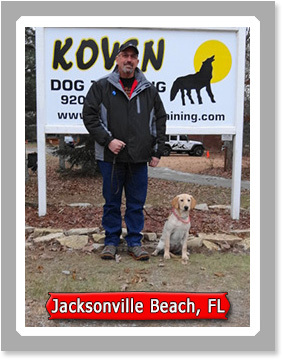 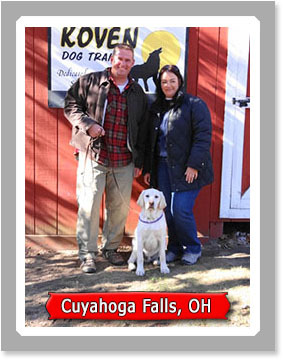 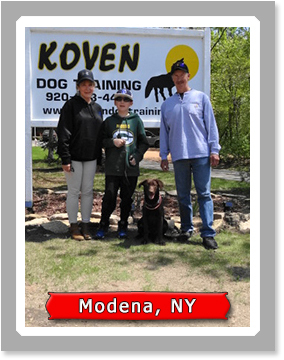 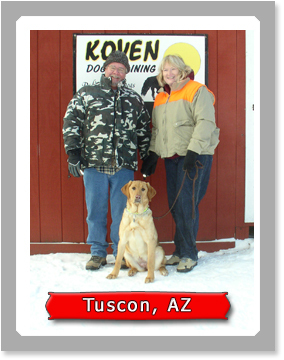 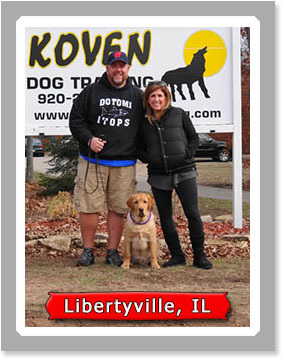 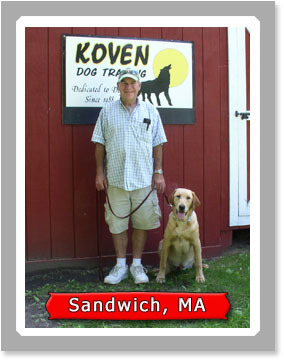 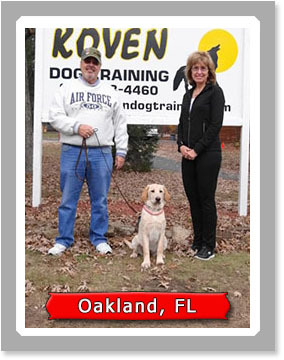 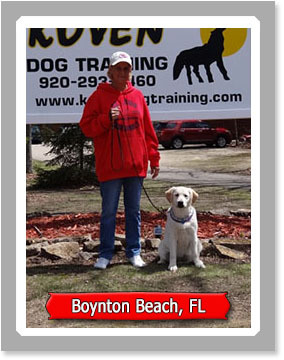 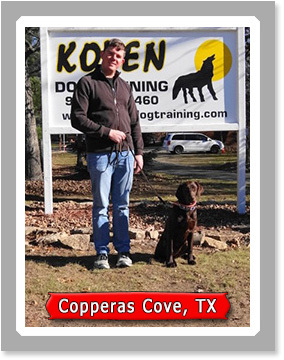 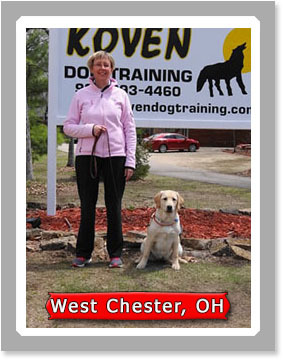 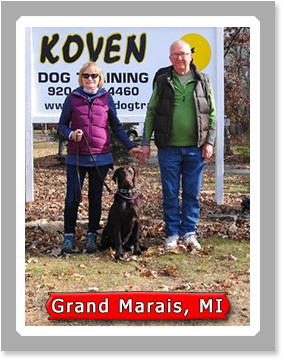 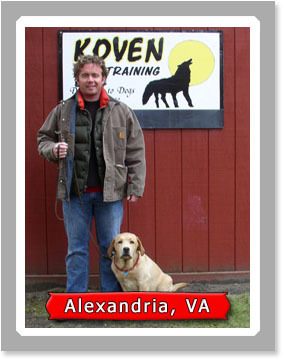 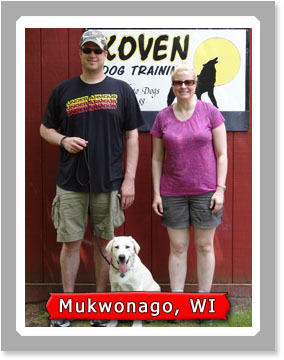 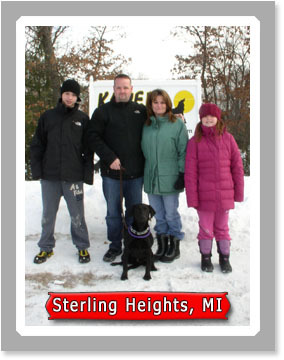 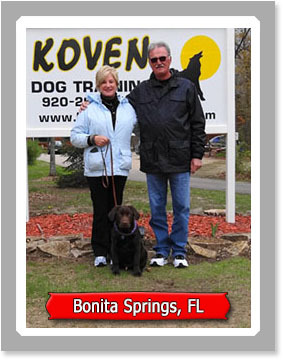 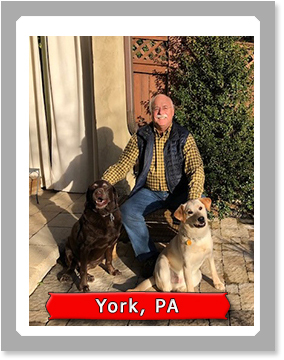 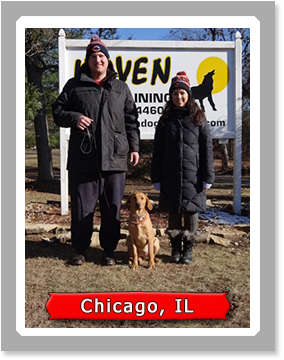 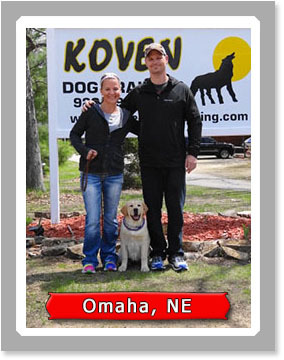 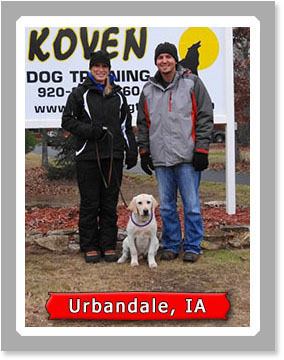 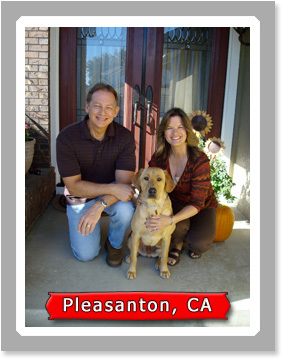 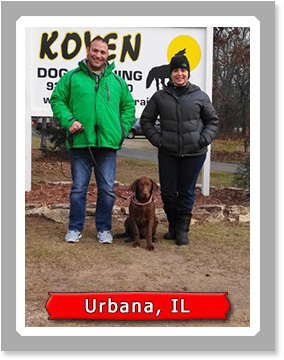 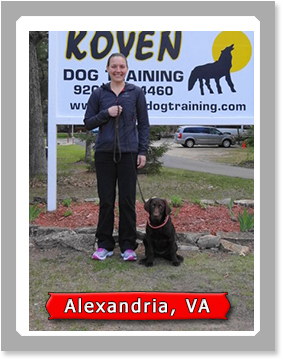 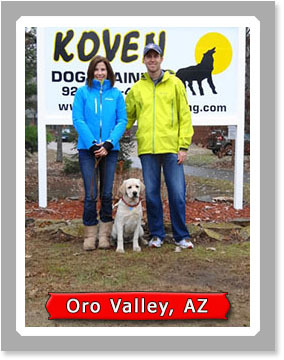 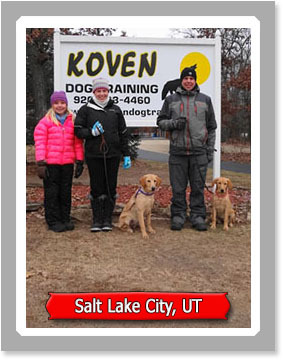 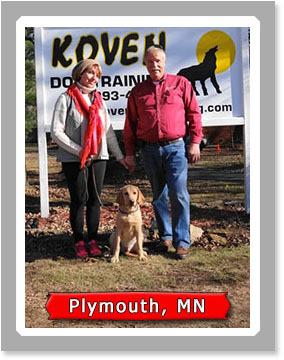 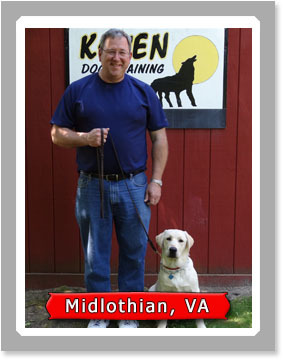 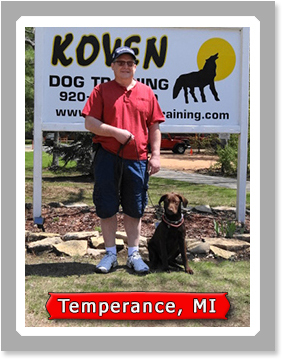 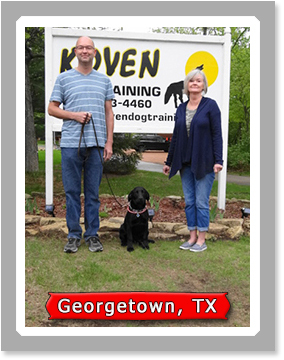 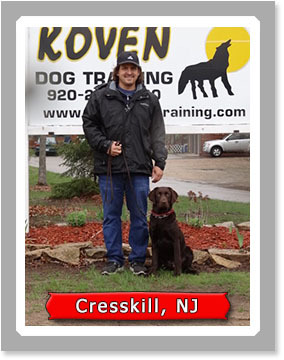 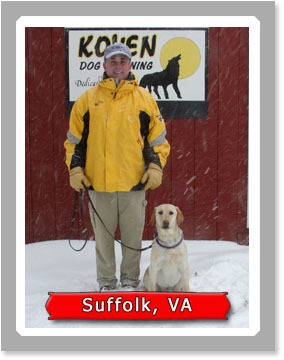 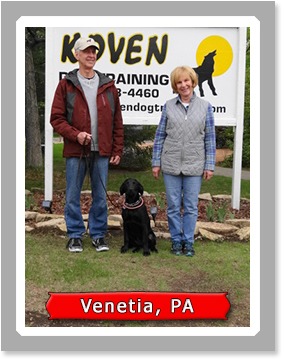 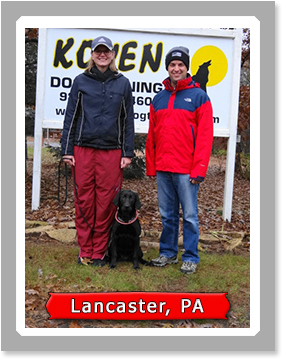 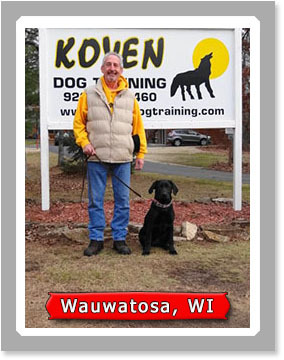 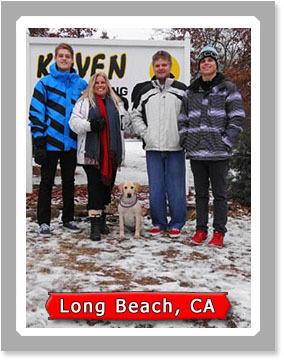 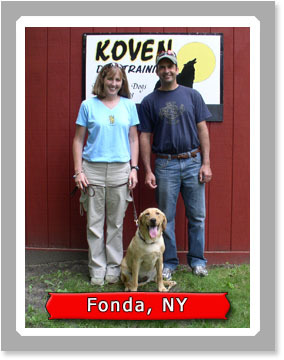 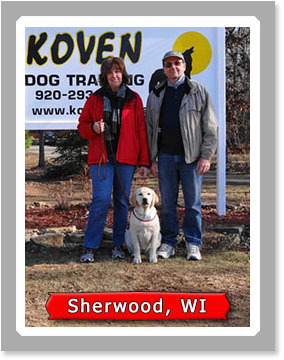 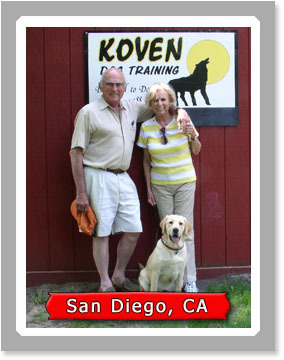 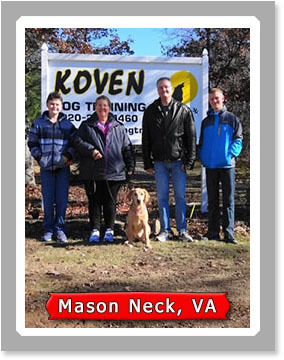 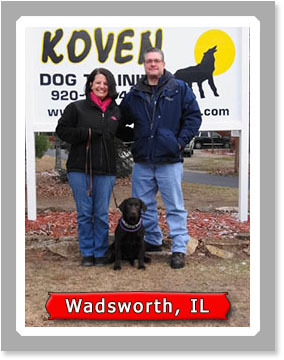 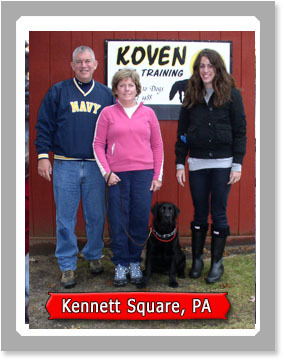 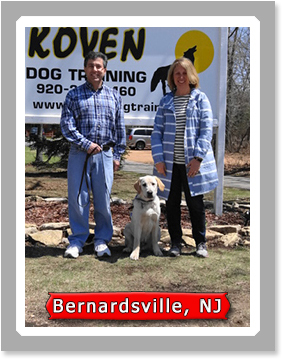 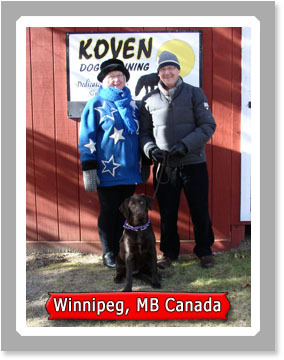 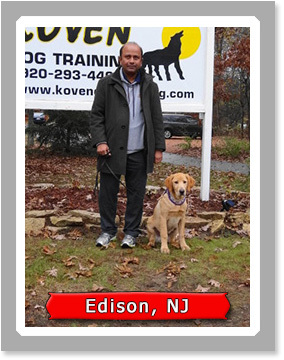 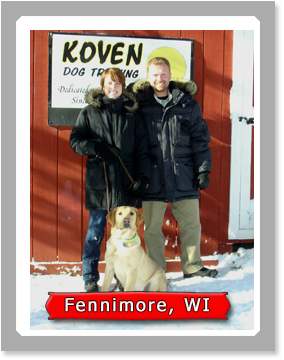 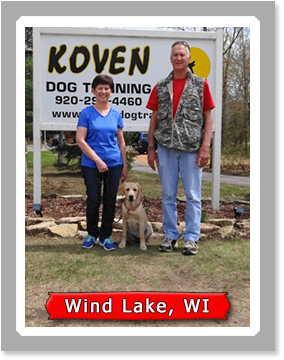 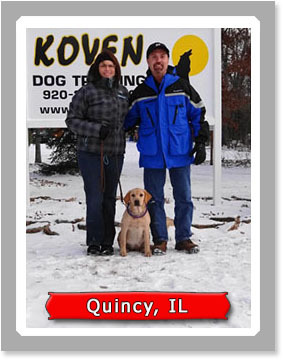 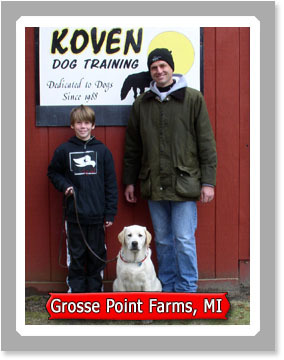 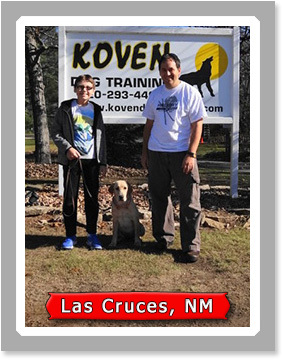 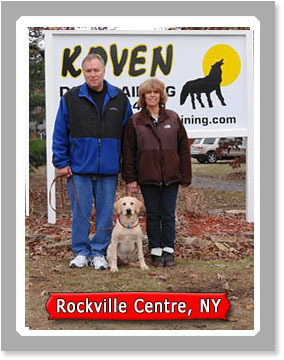 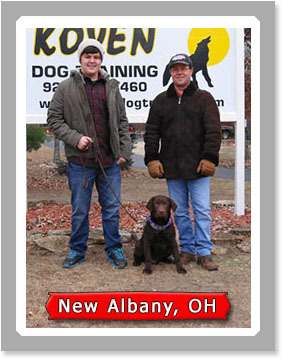 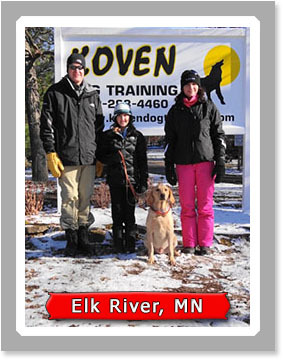 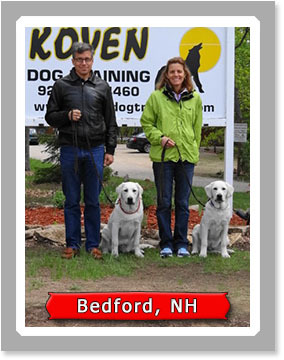 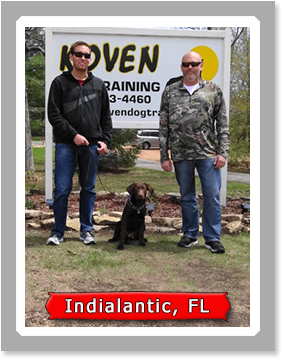 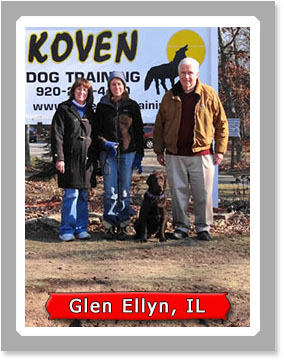 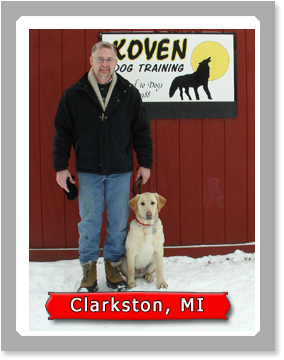 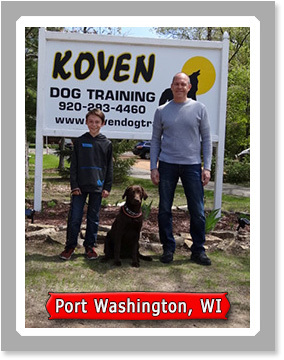 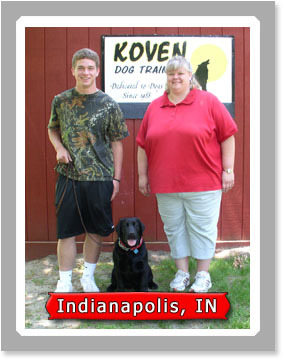 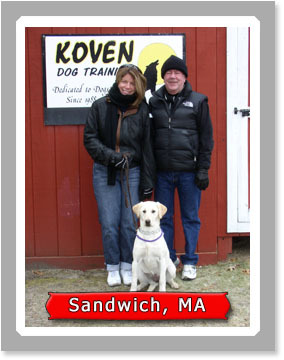 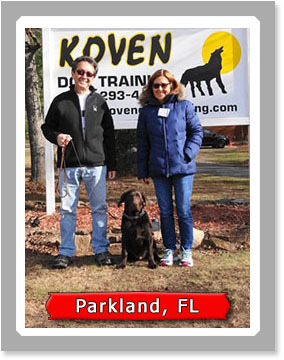 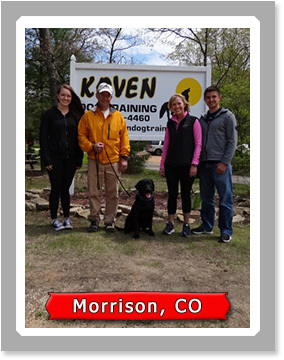 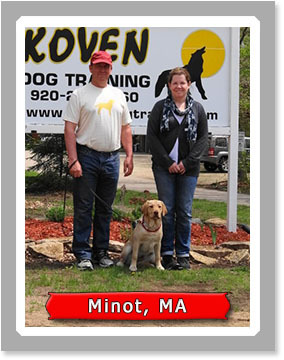 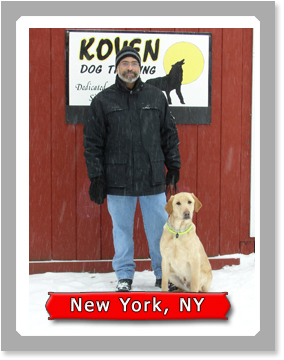 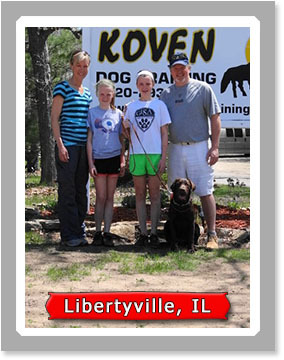 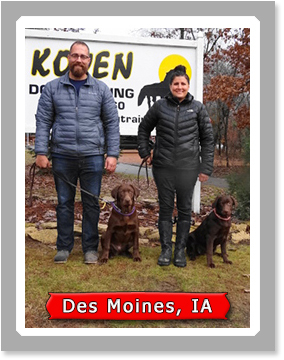 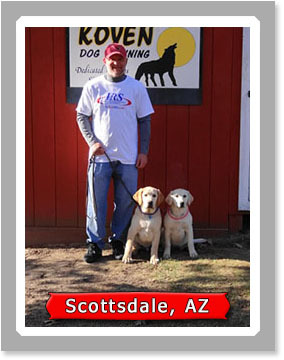 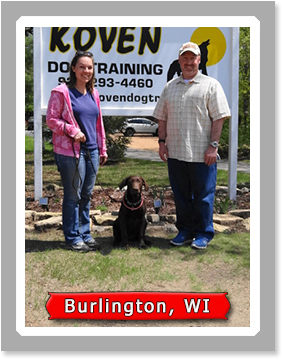 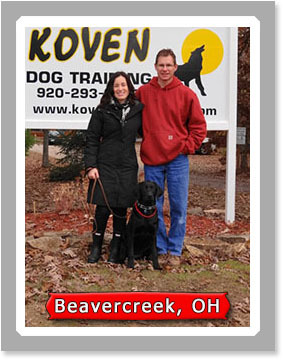 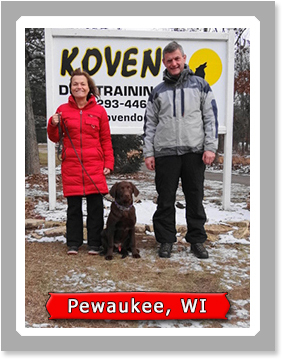 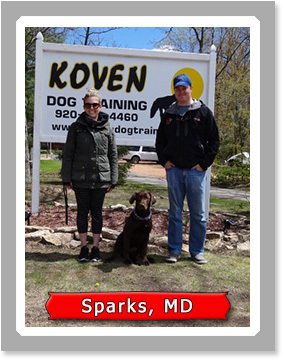 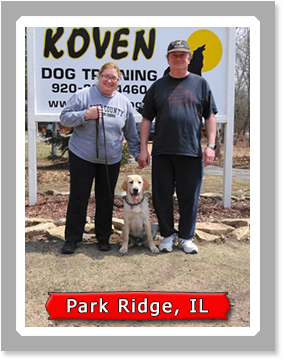 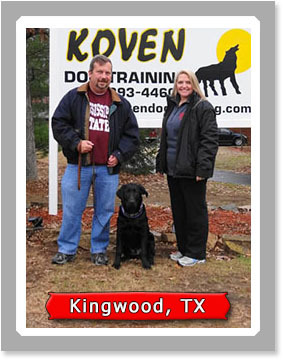 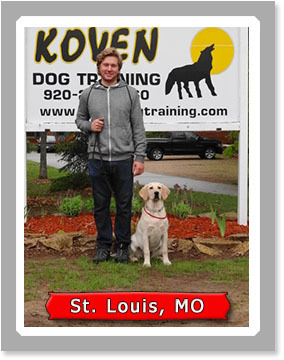 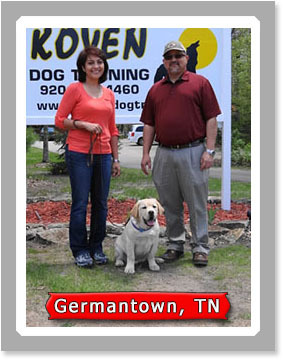 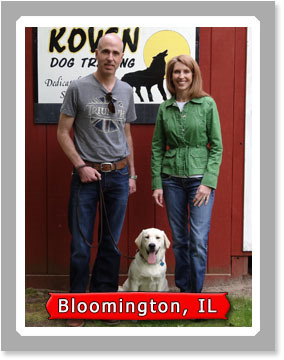 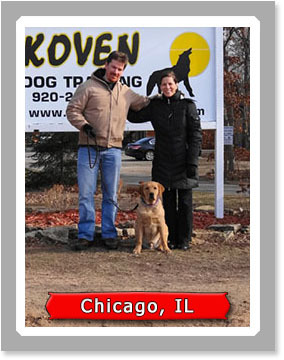 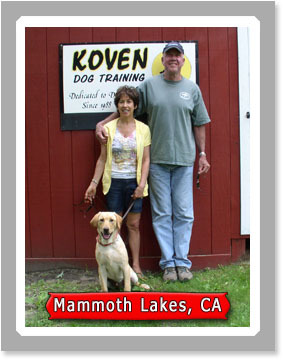 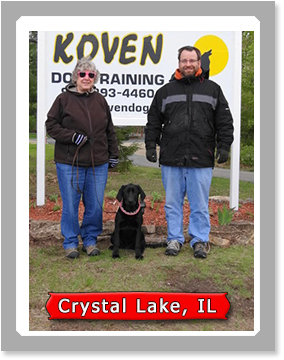 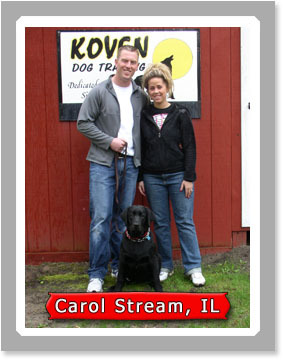 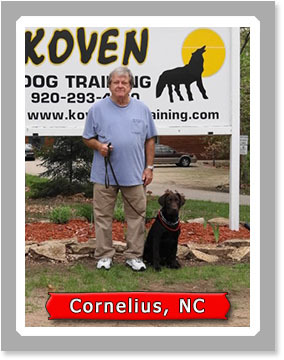 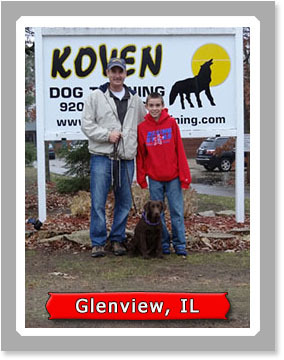 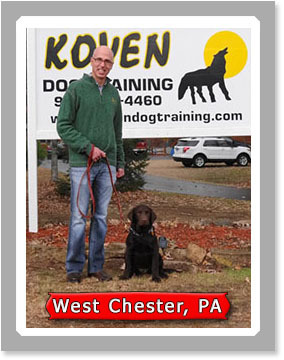 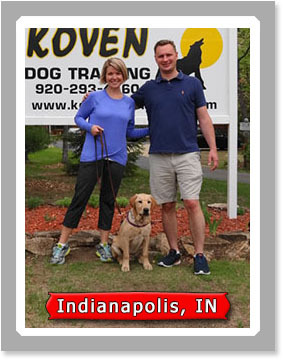 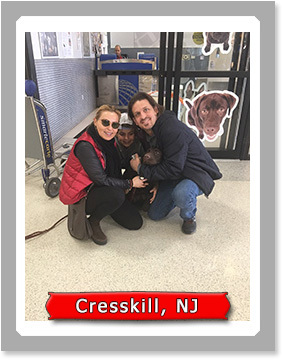 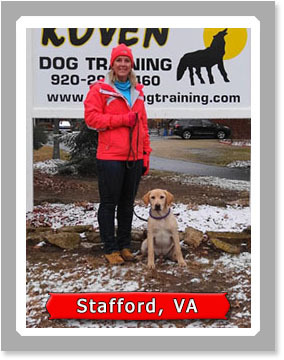 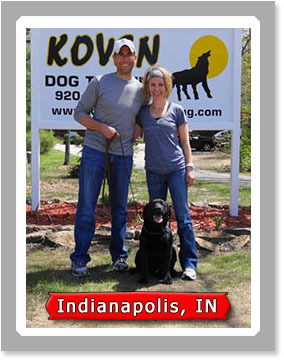 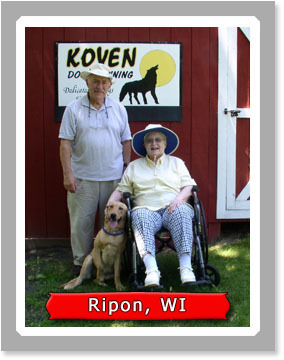 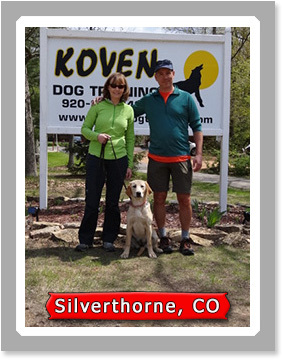 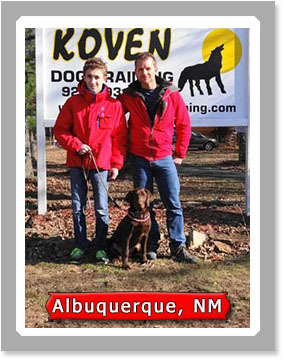 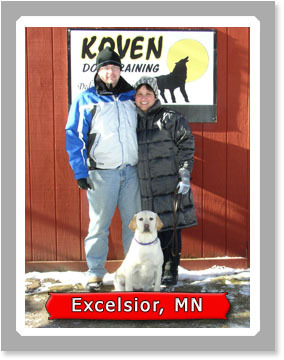 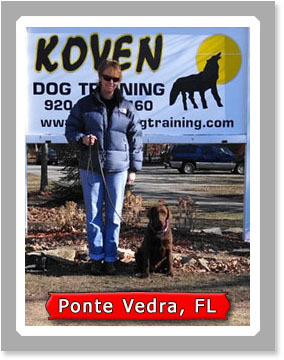 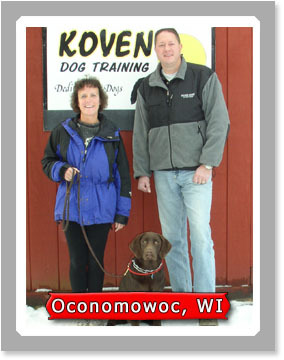 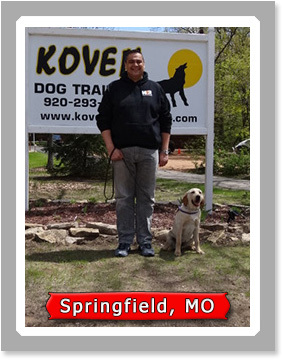 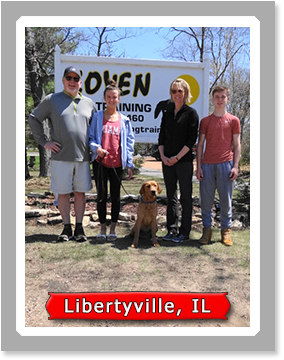 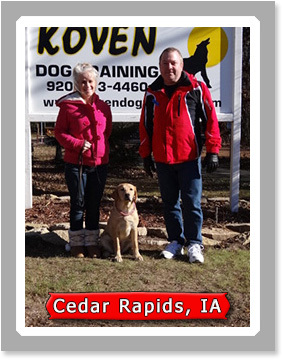 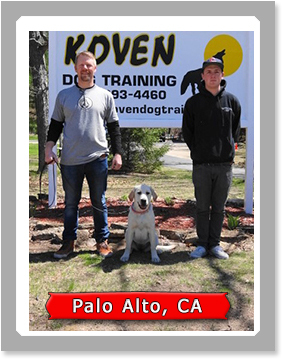 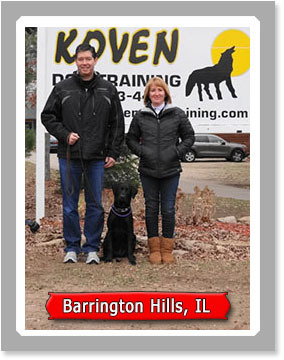 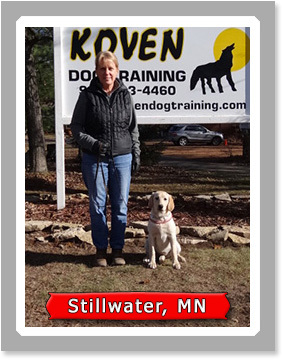 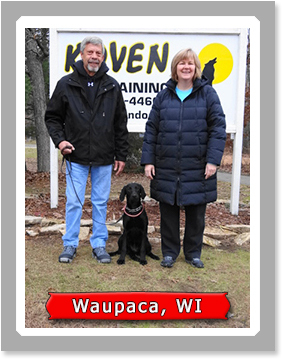 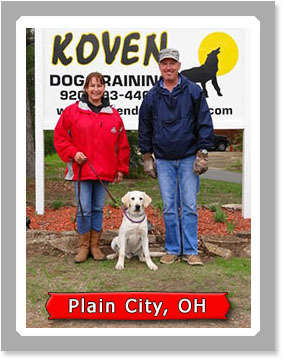 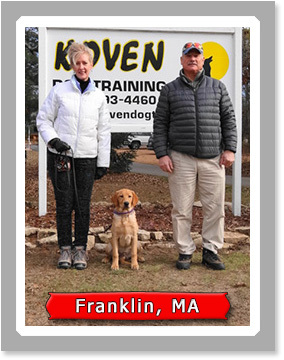 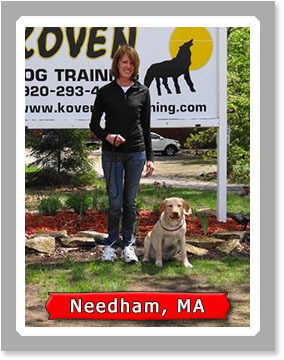 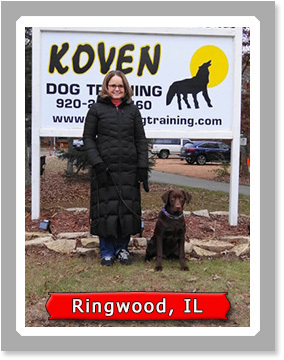 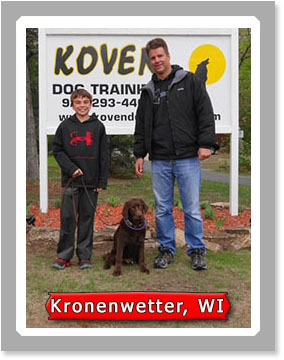 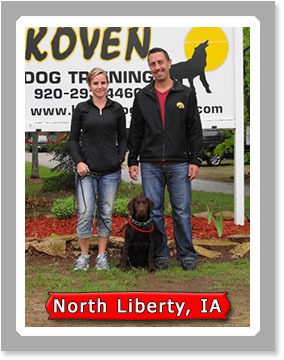 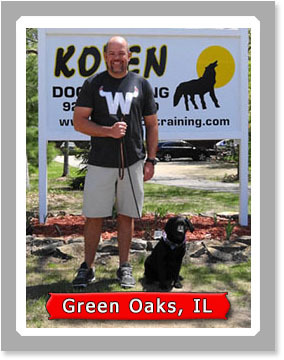 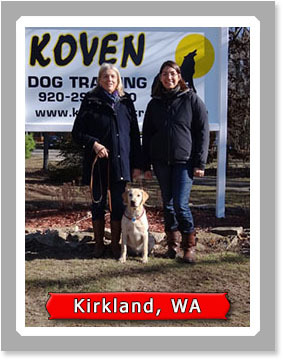 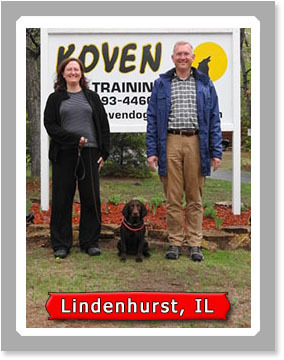 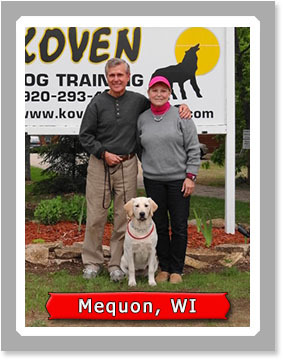 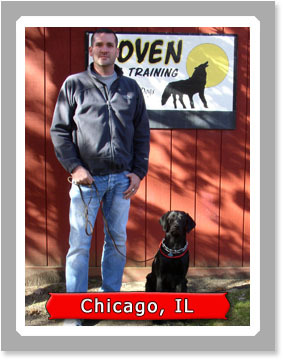 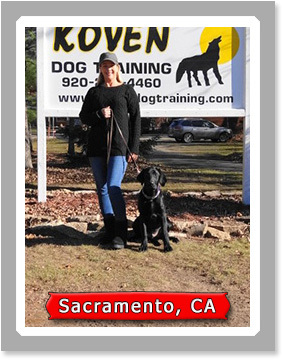 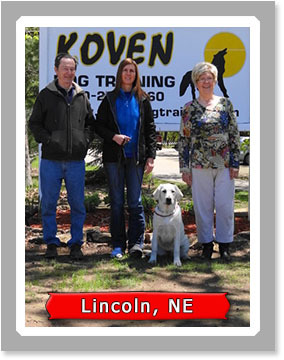 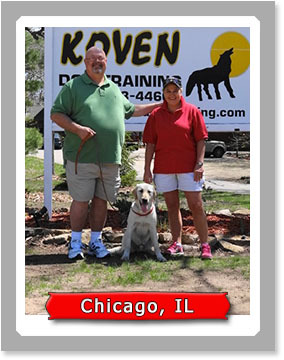 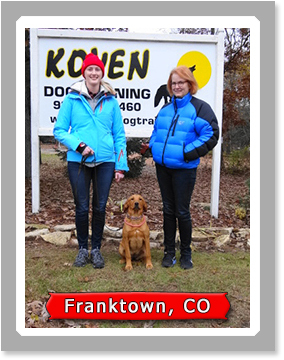 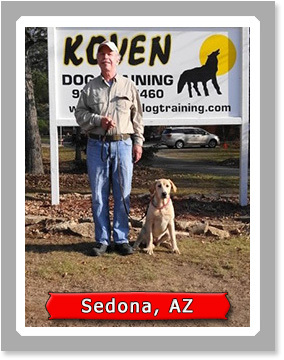 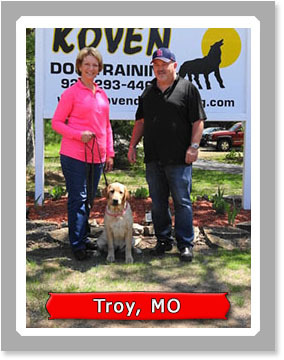 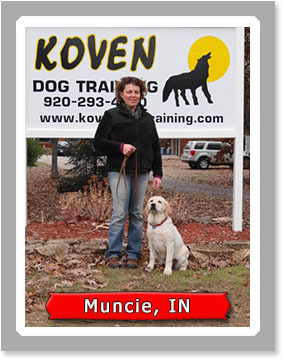 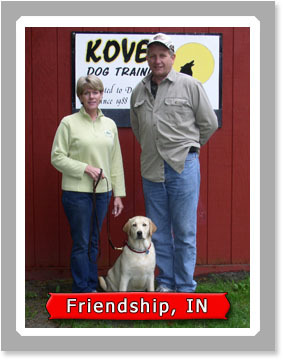 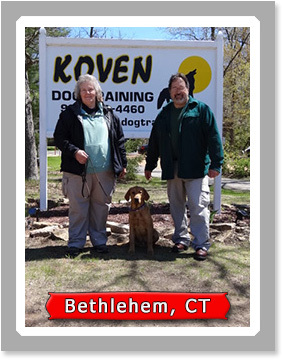 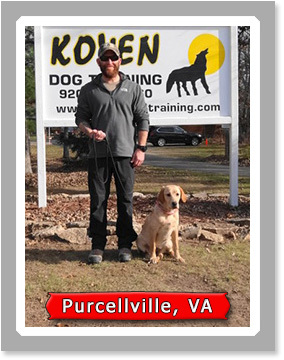 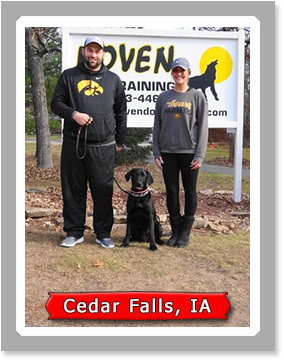 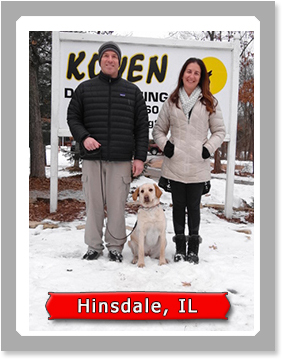 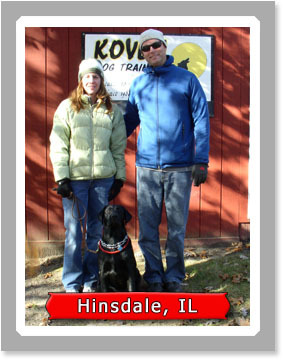 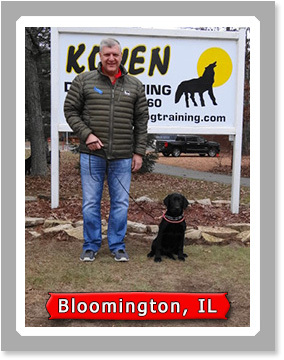 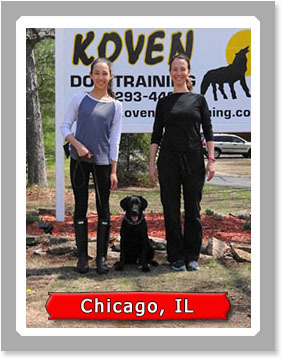 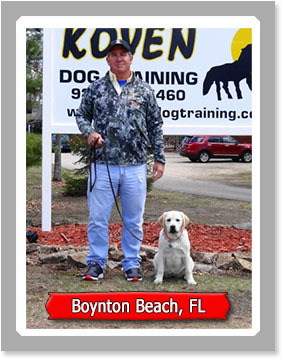 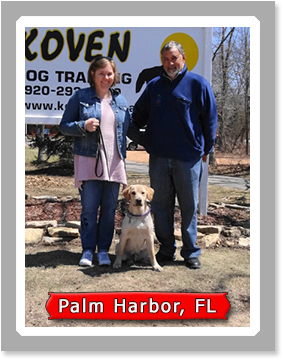 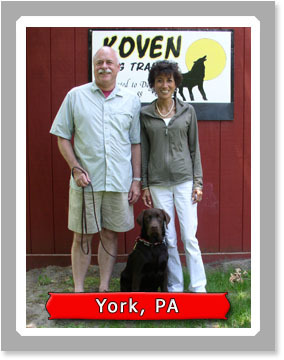 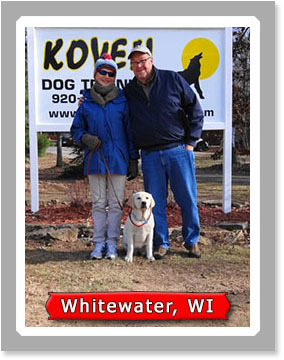 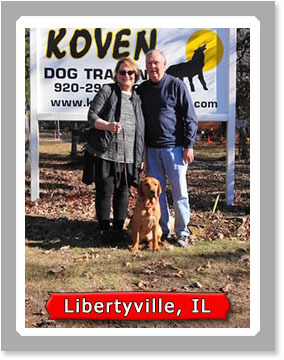 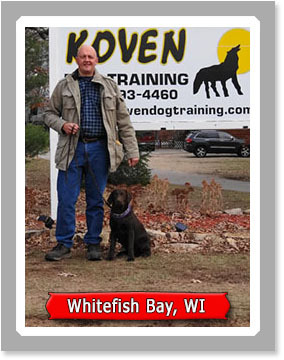 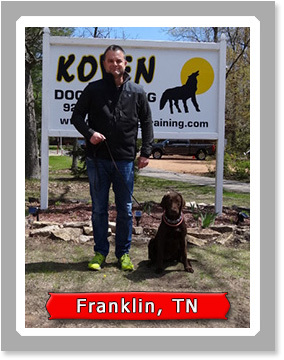 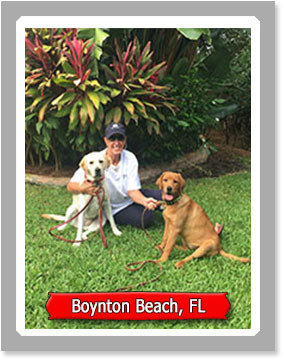 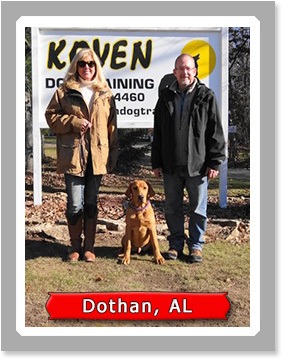 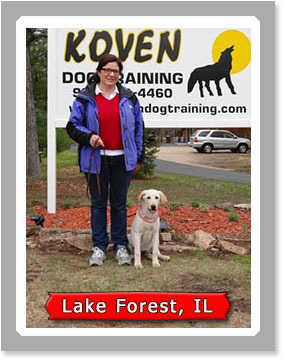 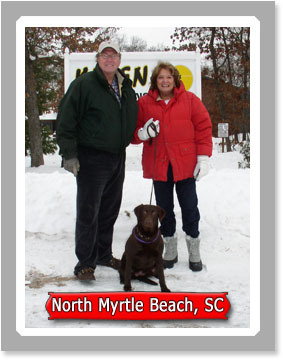 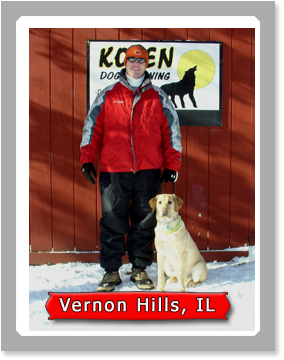 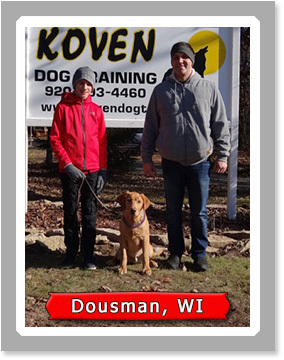 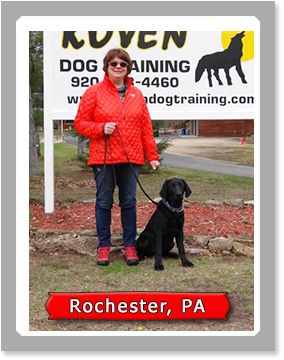 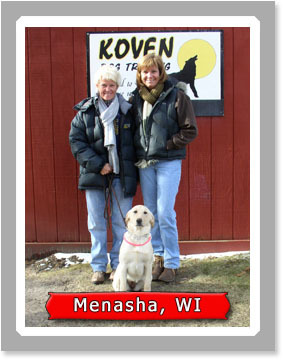 Husband and wife owners and head trainers Steve Koven and Jean Damon have been training dogs and working with dog owners for over 20 years. 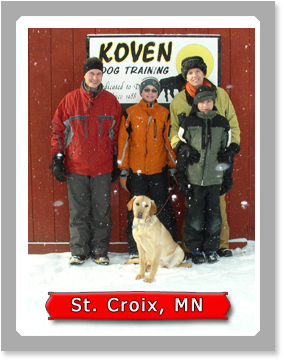 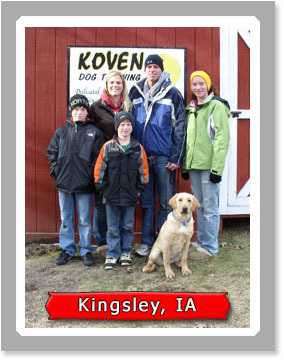 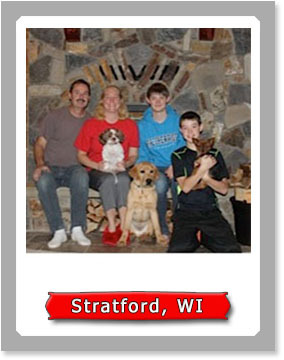 Our business is family-run; raising and training dogs is our full-time occupation. 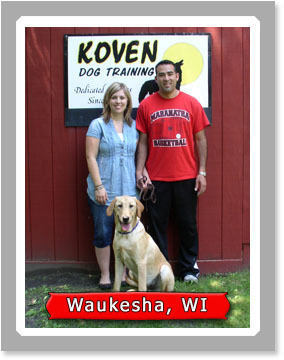 We are located in Neshkoro, Wisconsin. 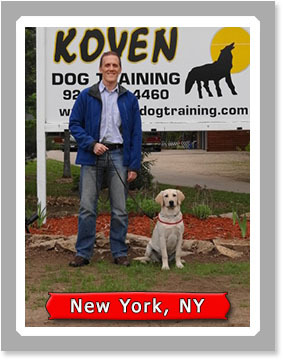 We do not believe in cookie-cutter dog training. 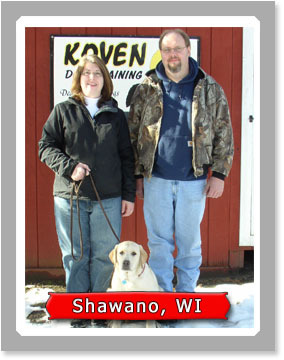 Each puppy is hand-picked for temperament from high-quality AKC registered bloodlines from breeders in the Midwest. 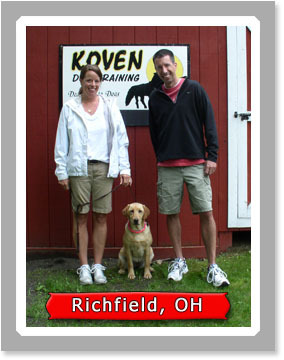 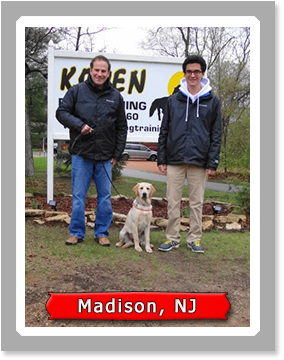 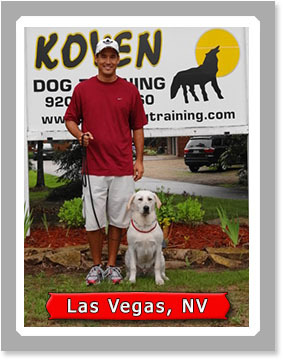 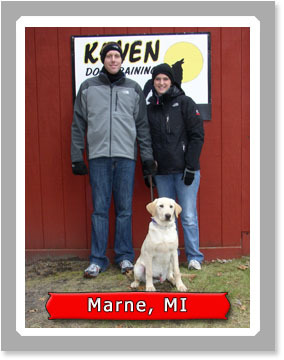 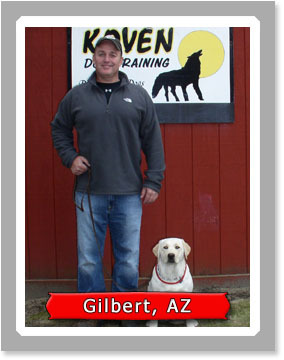 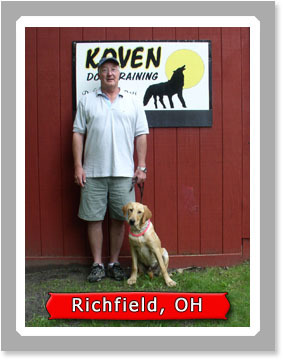 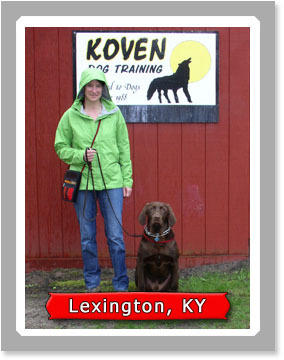 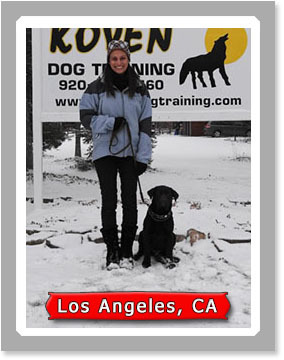 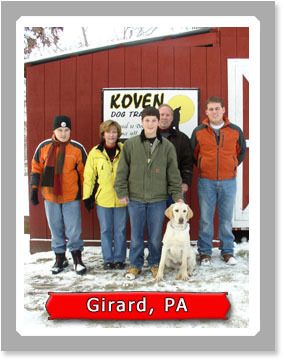 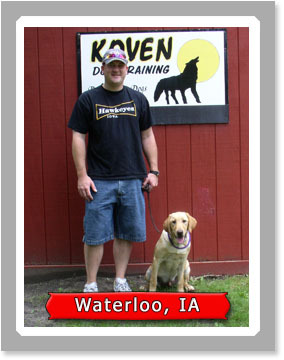 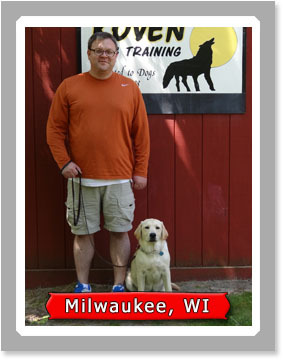 Our goal is to provide the highest quality of training for each individual puppy. 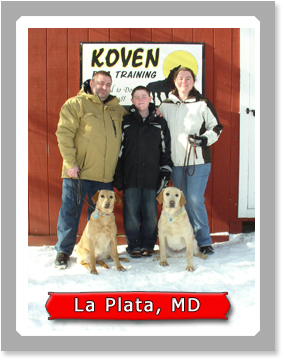 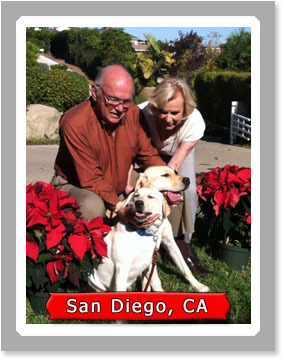 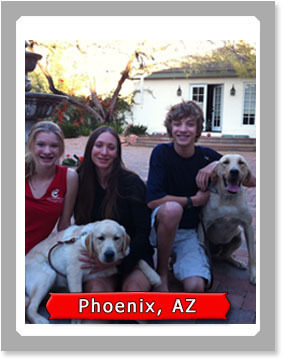 The cost of a family companion Lab is $6,000.00 plus sales tax. 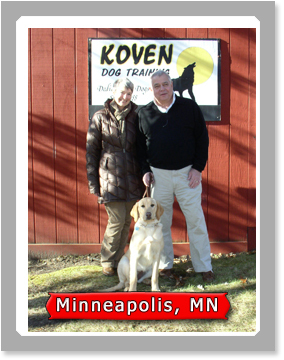 The parents of our companion puppies are OFA certified for hips. 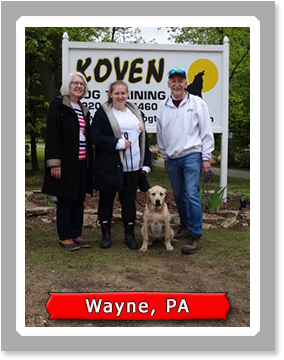 Your new pup will be current on the following: Rabies, Distemper combo (including Leptospirosis), Lyme, Bordetella, Heartworm preventative, and flea/tick protection. 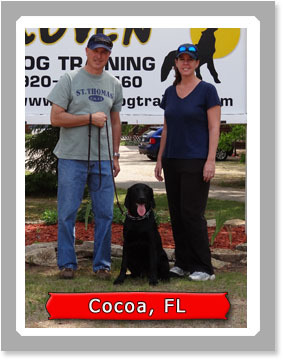 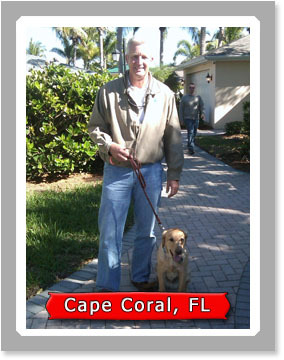 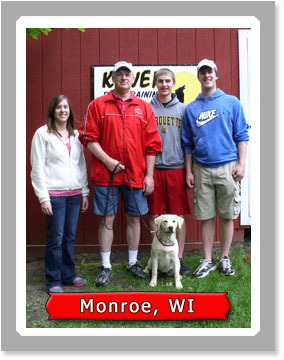 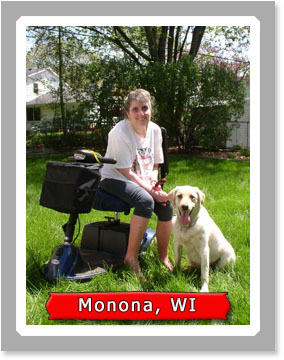 Our companion dog training covers behavior and social skills with people and other dogs, crate training, and obedience. 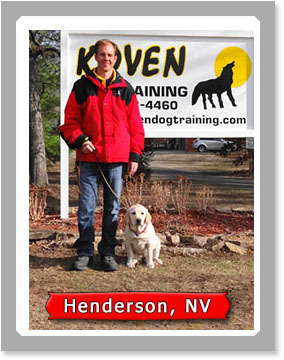 The obedience training covers all commands on and off-leash. 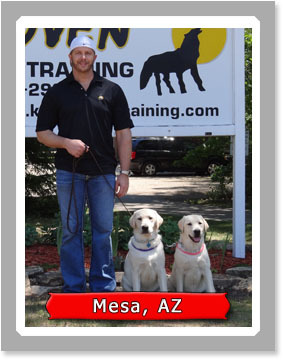 Training starts when our labs are 8 weeks old. 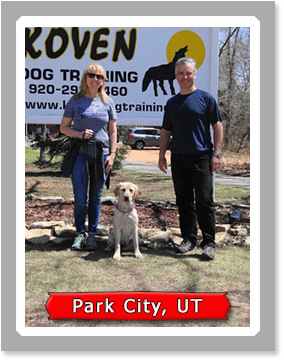 They go through a thorough training regiment 6 days a week, and graduate the family companion program at around 6 months of age, when they will be ready to interface with their new owners. 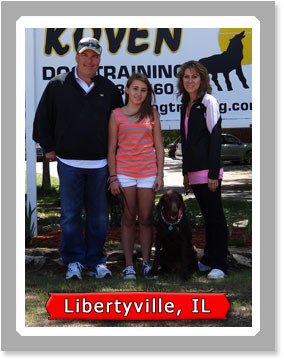 Listed below are the commands that we cover. 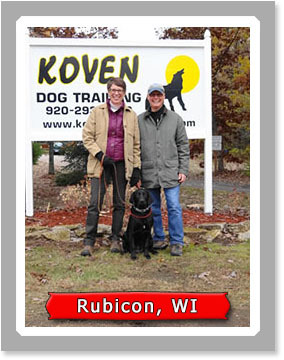 There is no such thing as a robotic dog. 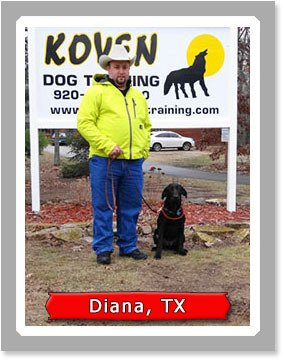 This means that having a well-trained dog requires consistent reinforcement of commands and good behavior. 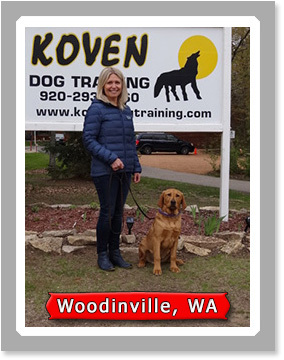 It is imperative that you, as the new dog owner(s), continue to exercise your new family member daily, as well as routine obedience workouts 3-4 times a week, and always follow up on your commands. 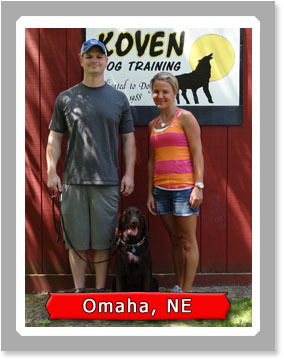 Because of the amount of training already done with our dogs, this will be relatively easy for you to accomplish. 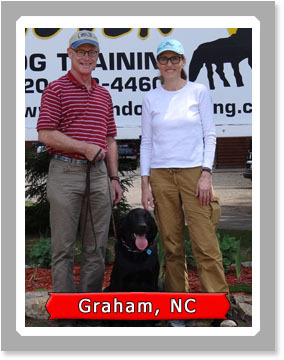 Without this maintenance of your dog’s training and behavior, the solid foundation that you started with can slip, and regression in training will occur. 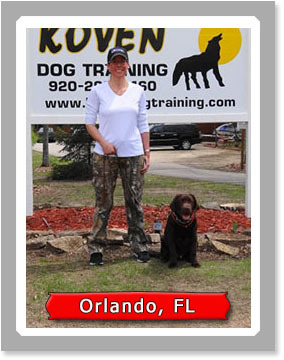 It is much easier to maintain your dog’s level of training than to retrain a dog once it has regressed. 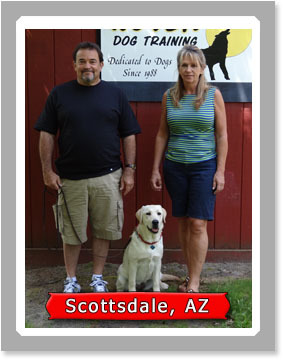 We will give you a solid well-trained puppy/dog, and everything you need to maintain it. 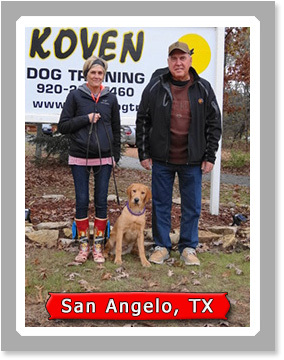 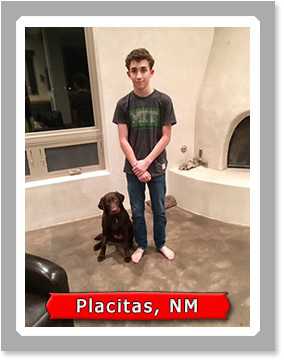 On your scheduled pick-up day, you and your family will spend the day at our facility interfacing with your new best friend, learning how to work with and train your dog. 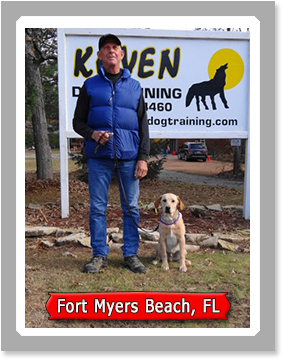 Our goal is for you to acquire a high level of comfort and confidence in your skills with our K-9/handler interfacing program, and we will work with you until this is achieved. 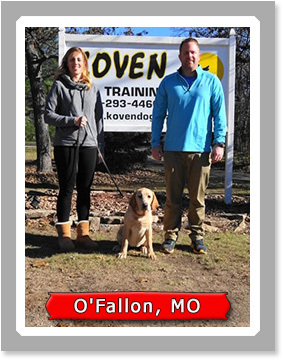 Upon completion of this program, you will receive a certificate of completion of training for obedience, as well as all your training gear. 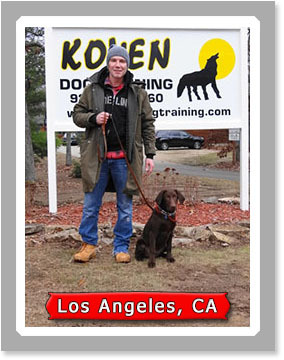 You will receive a 6 ft leather lead, training collar, nylon choker, and light lines to continue your off-leash work. 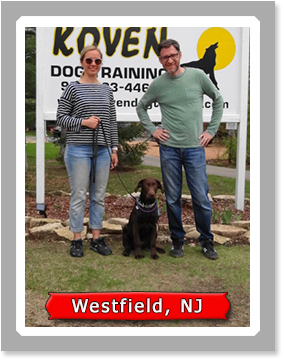 You will be taking home a high quality pup with everything done for you: crate-trained, current on vaccinations for the next year, and obedience trained; a calm, well-behaved dog ready to be integrated into your family. 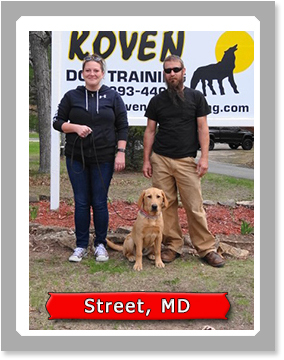 All you have to do is keep up with your pup's preventative health care (monthly heartworm and flea/tick treatments, yearly vaccinations) and maintain and strengthen the foundation that we built for you. 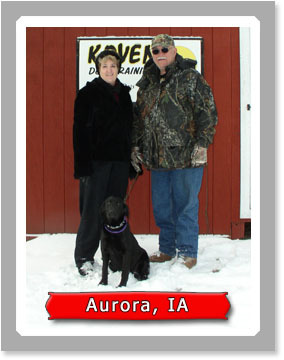 These pups are sold with Limited AKC registration only. 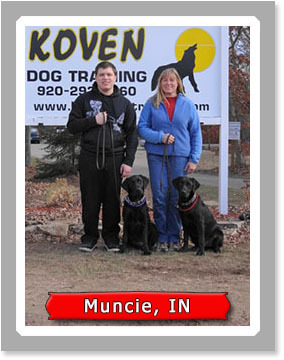 They are not to be bred. 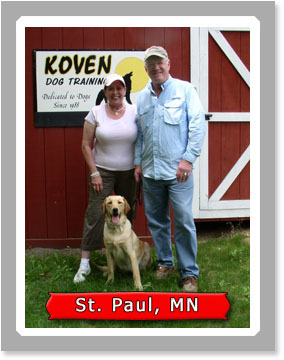 We highly recommend getting your pup spayed or neutered between 44 and 50 weeks of age. 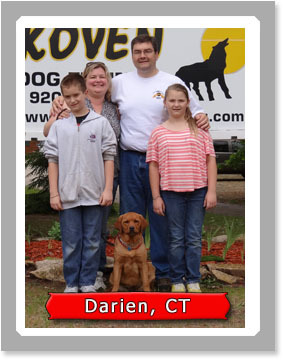 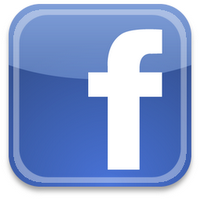 You can always count on us for any follow-up help or questions you may have. 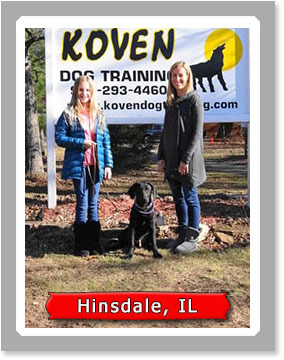 If you would like to fly your puppy back home after interfacing with us in Wisconsin, we recommend United Airlines via Chicago/O'Hare (www.united.com, Petsafe program). 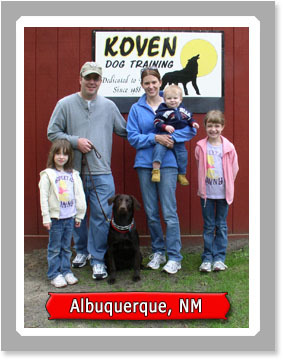 Additional costs would apply. 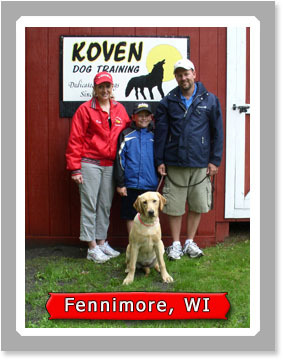 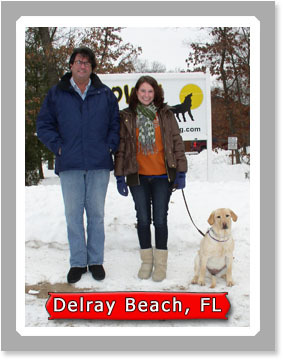 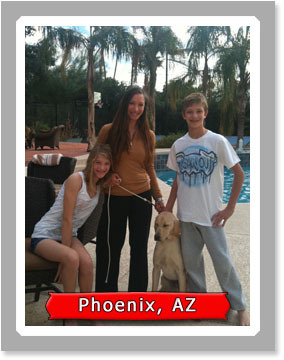 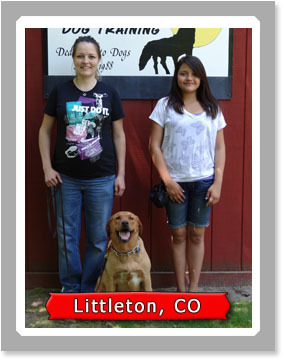 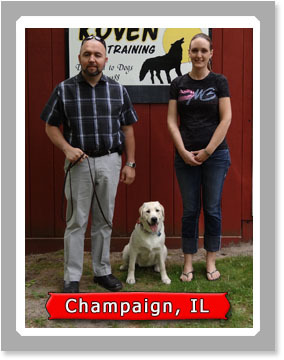 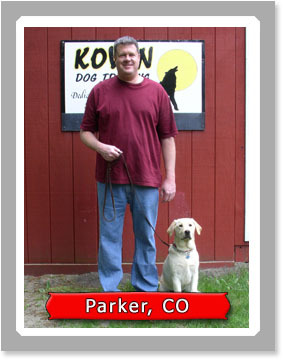 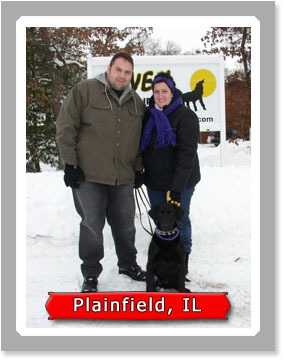 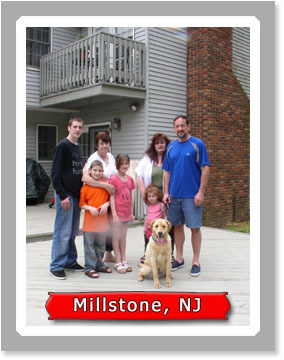 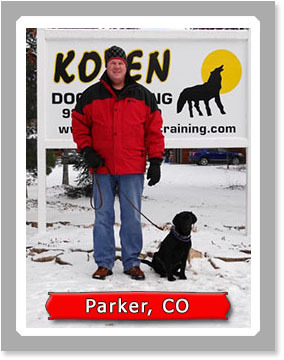 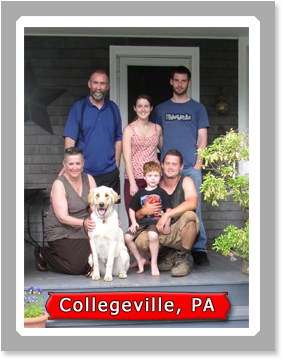 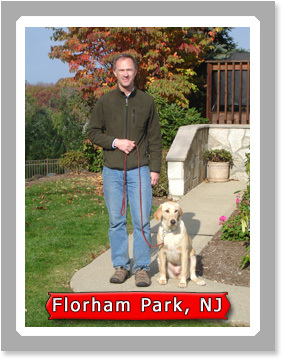 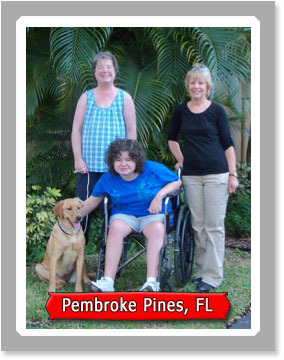 Please look through some examples of our family companion training. 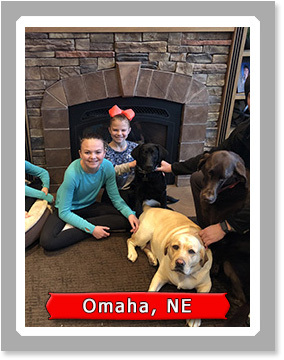 These pictures were taken in early February 2019. 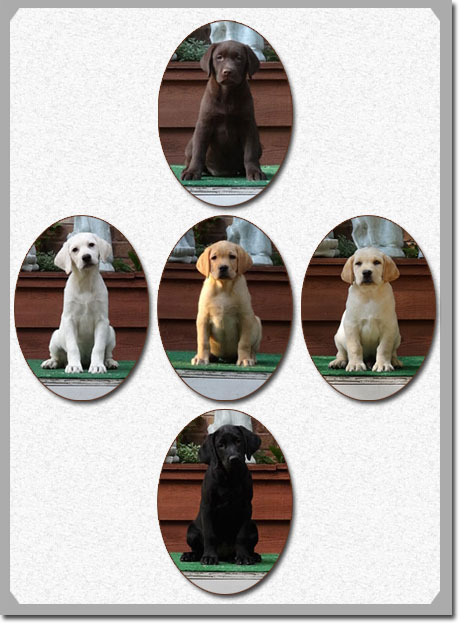 This group of puppies ranges from 11.5 to 14.5 weeks in age, and are shown in order from youngest to oldest. 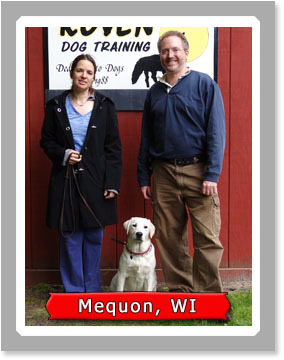 They will be ready to interface at our school in Wisconsin in May. 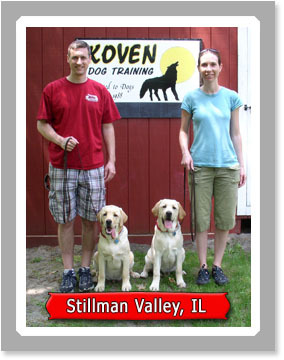 We are now accepting payments for these puppies. 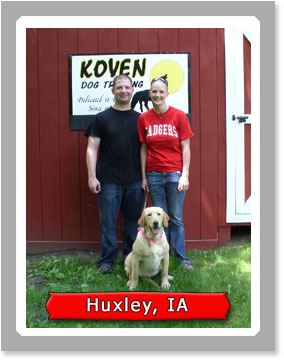 Those who reserve their puppy early will have the opportunity to name their new pup. 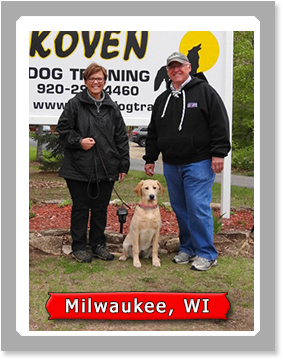 If you have any questions or you are interested in a trained Labrador puppy, please contact us or call 920-293-4460, prior to submitting an application. 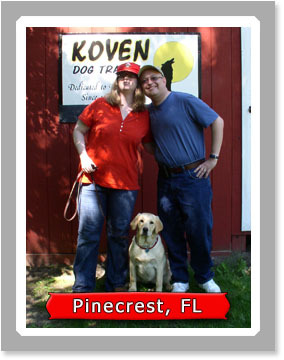 Our website is updated every few days year around.